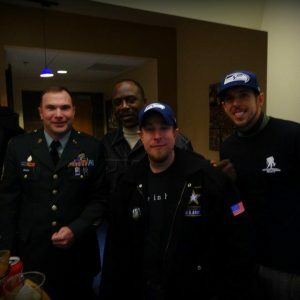 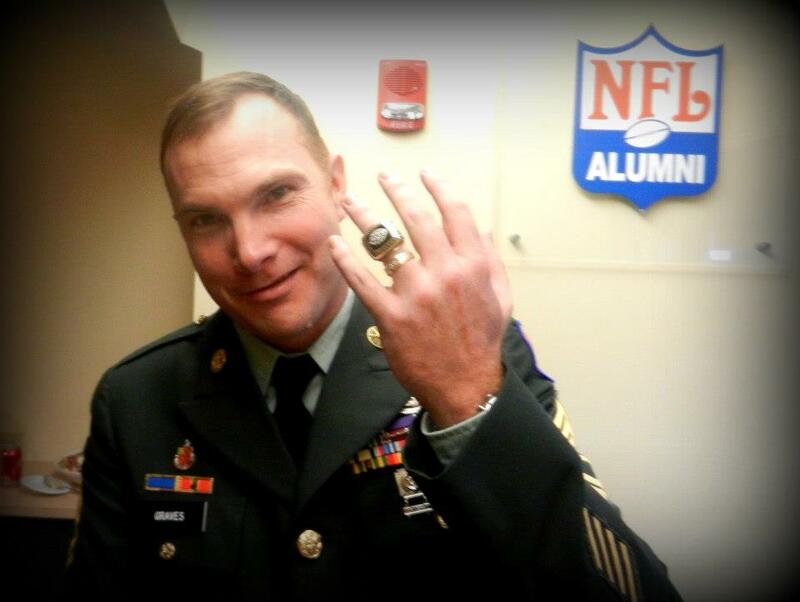 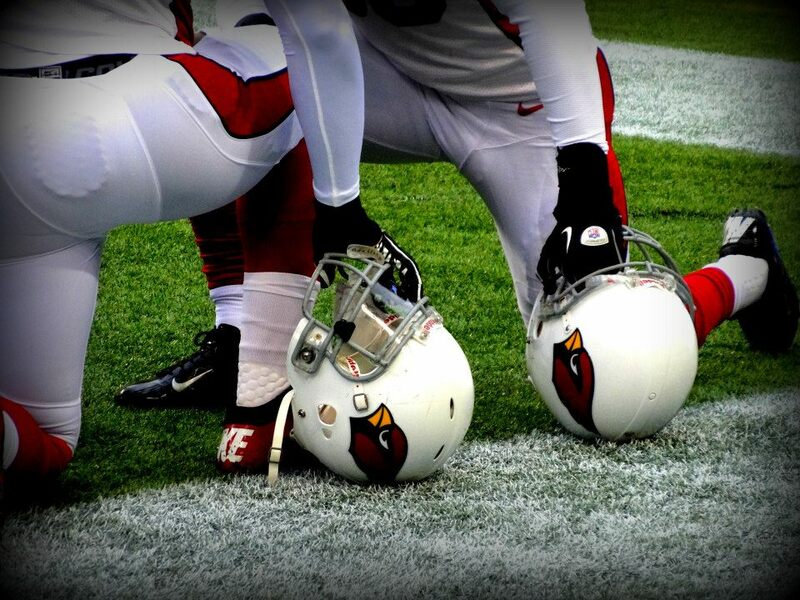 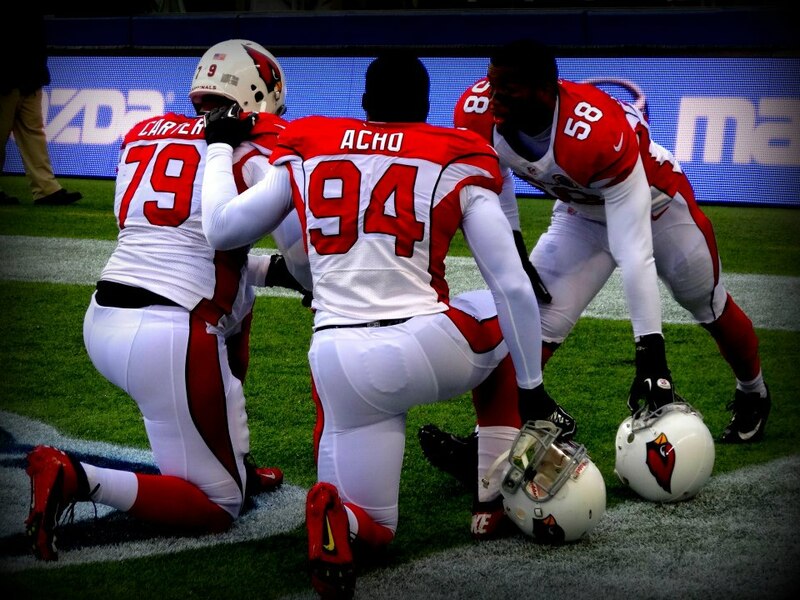 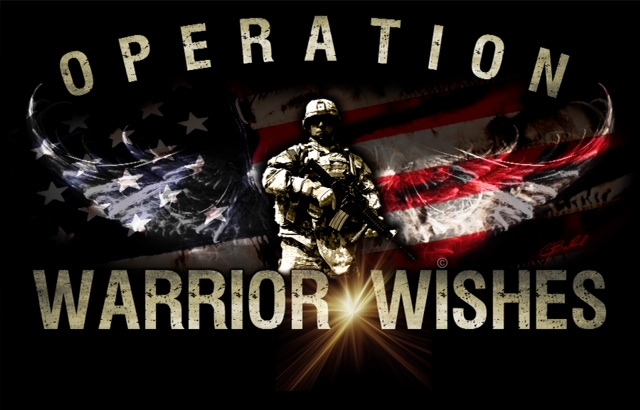 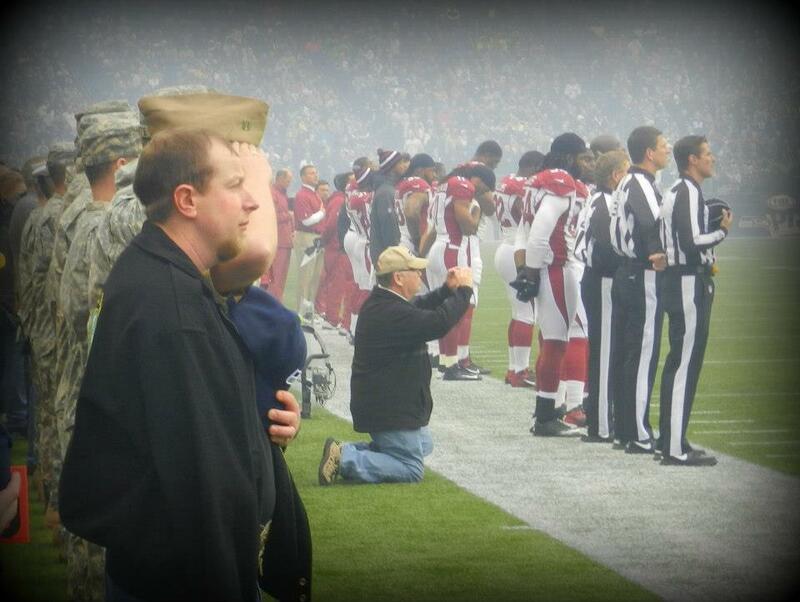 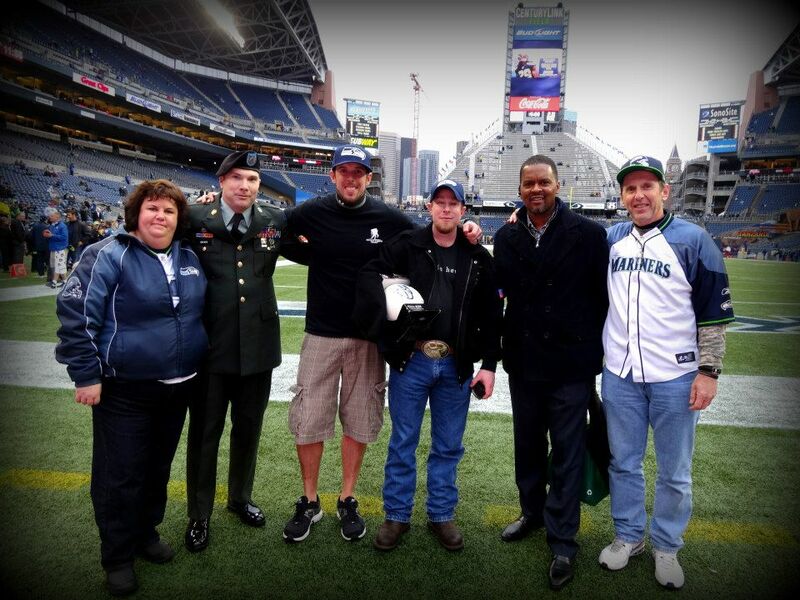 Honoring Army Warriors Shawn Graves & Trevor Phillips. 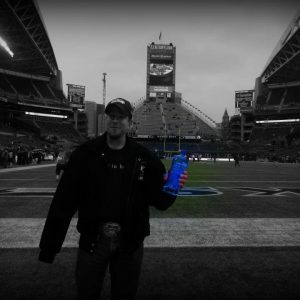 On December 21st, 2004, Shawn Graves said a final goodbye to the world as he lost consciousness. 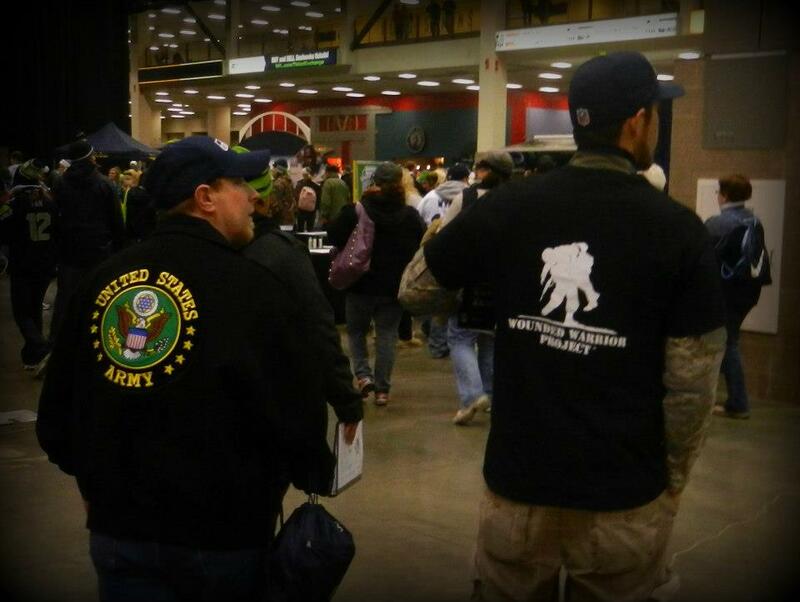 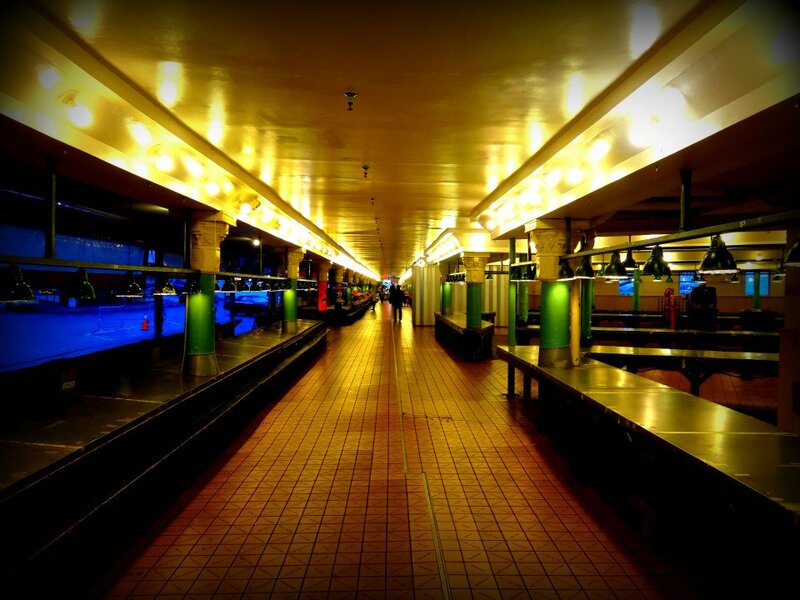 A man wearing a suicide vest had blown himself up inside a dining hall in northern Iraq. 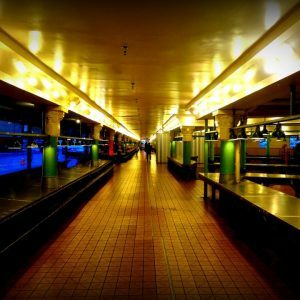 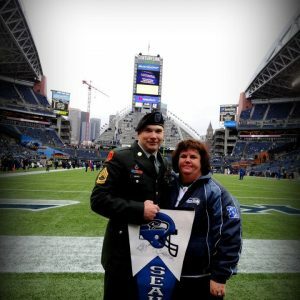 Graves had wounds all over his torso, and he did not expect to open his eyes again. 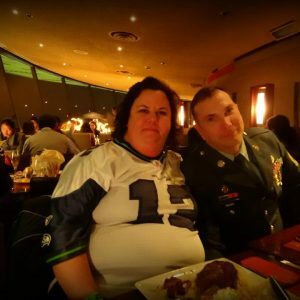 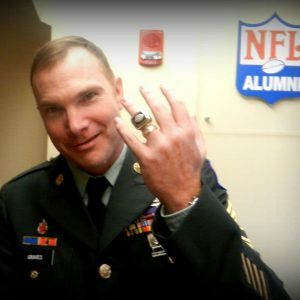 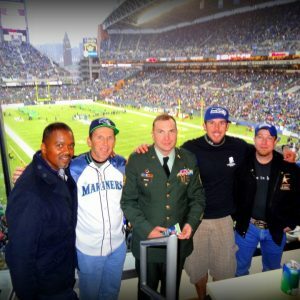 The platoon sergeant from Fort Lewis woke up from a coma three weeks later. 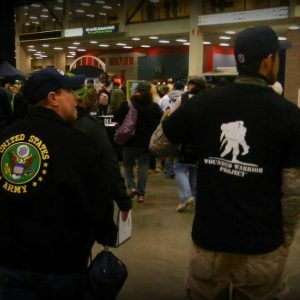 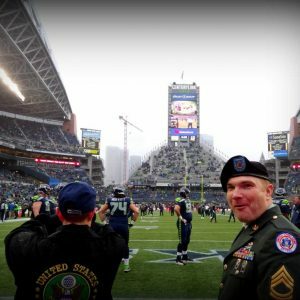 He had survived one of the worst attacks against U.S. forces in the Iraq War, an enemy infiltration that claimed 22 lives and wounded more than 70 other people inside a forward base most troops figured was safe. 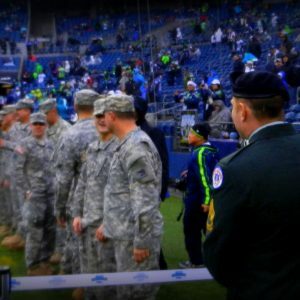 To this day Graves hears Iraq whenever a piercing note reverberates in his ears, reminding him of the sound of the explosion that nearly killed him. 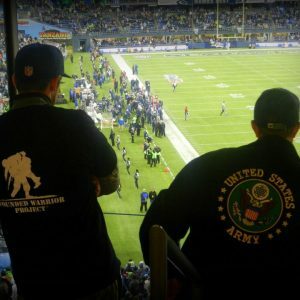 He has learned how to calm himself when the war surges back into his mind, telling himself, “You’re OK, you’re fine,” until he is. 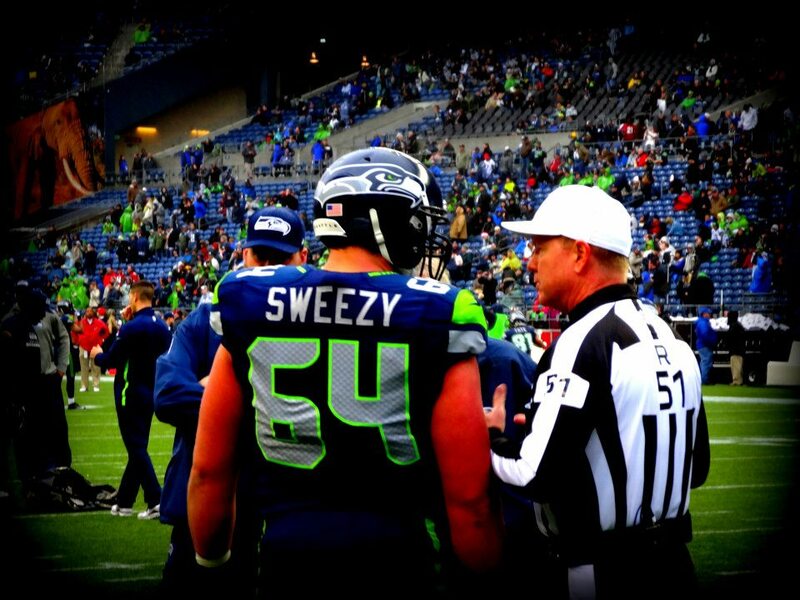 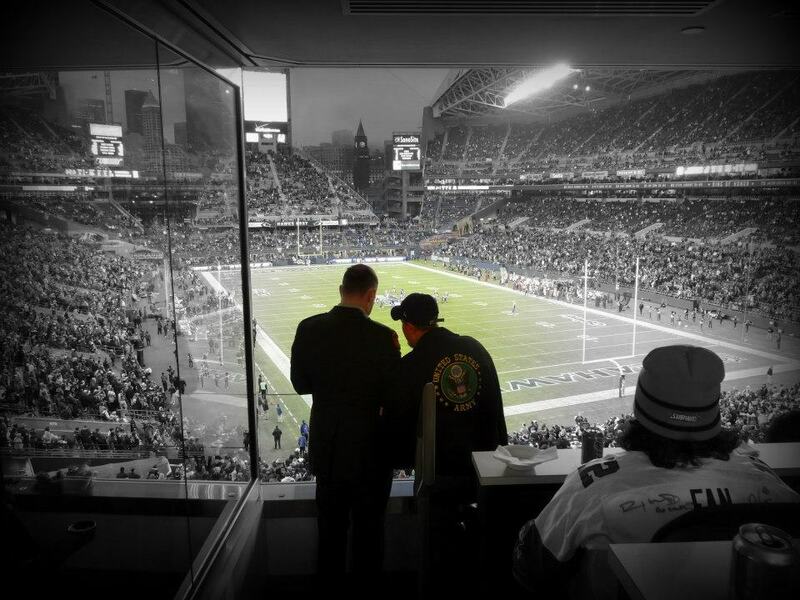 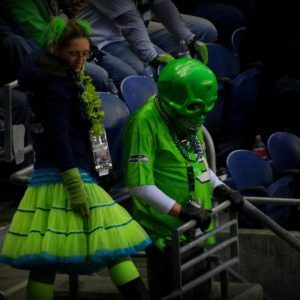 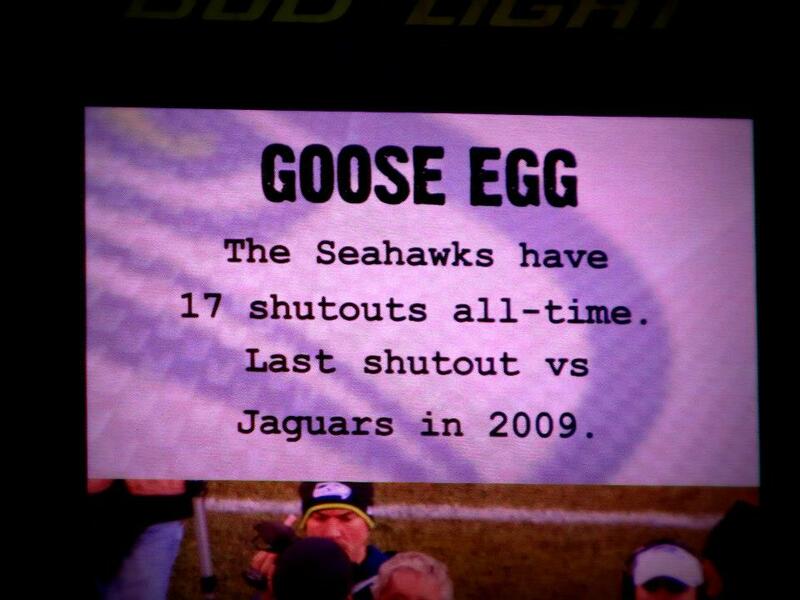 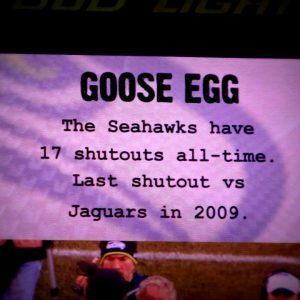 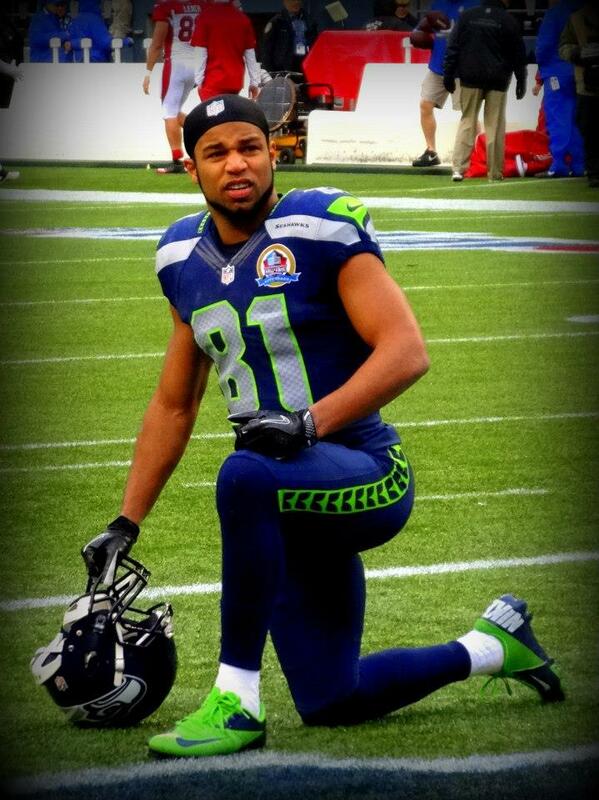 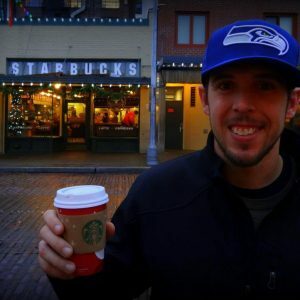 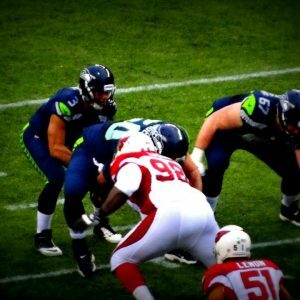 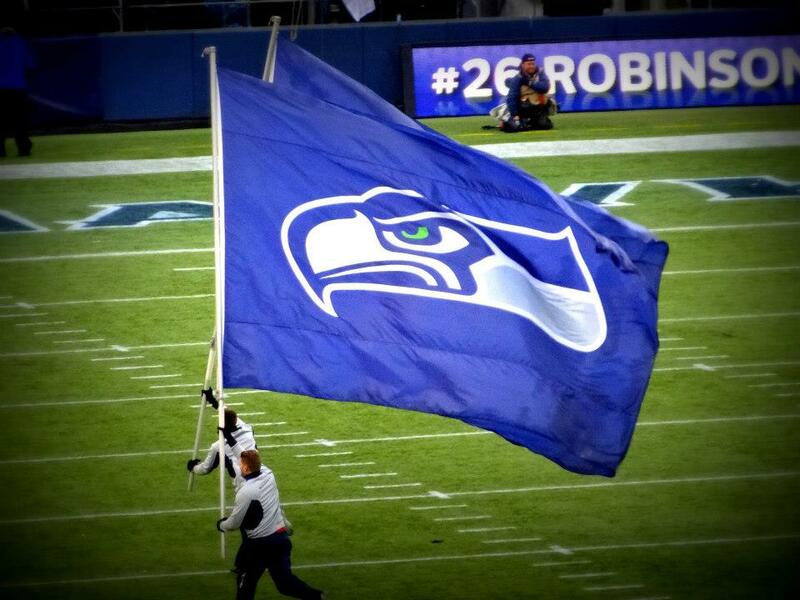 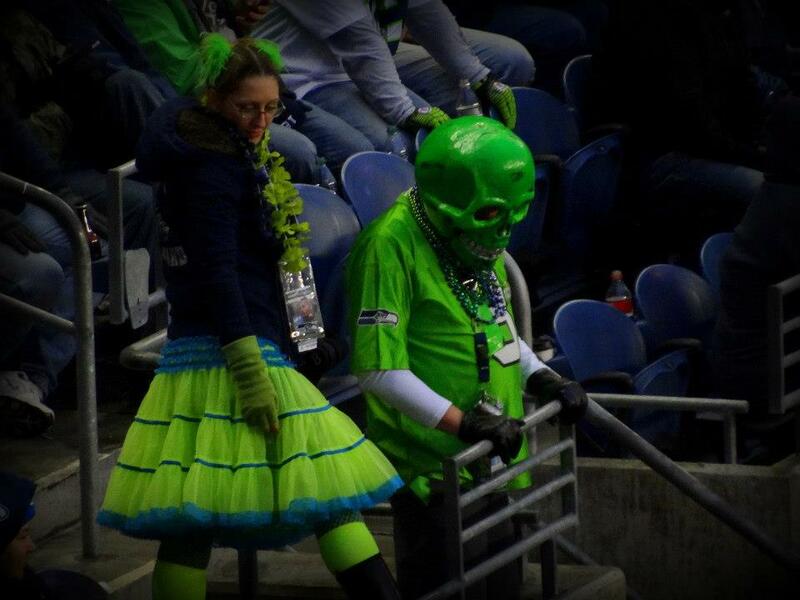 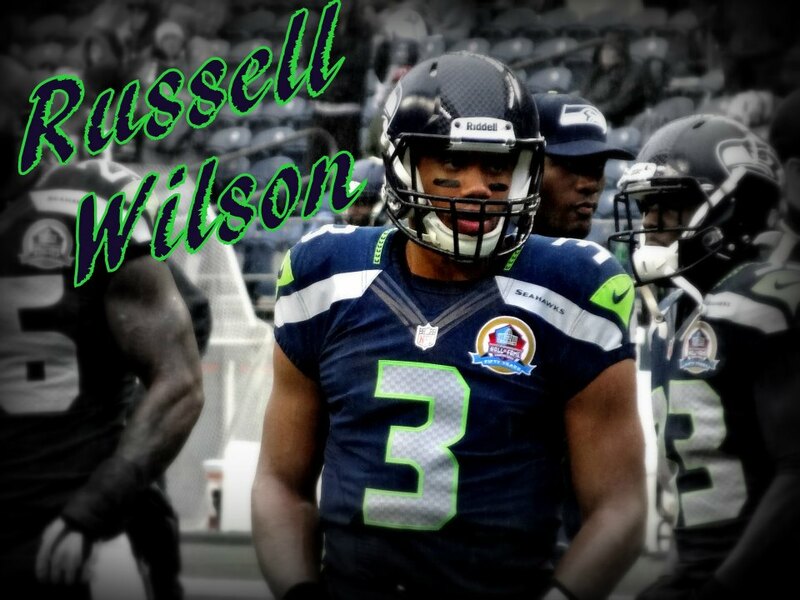 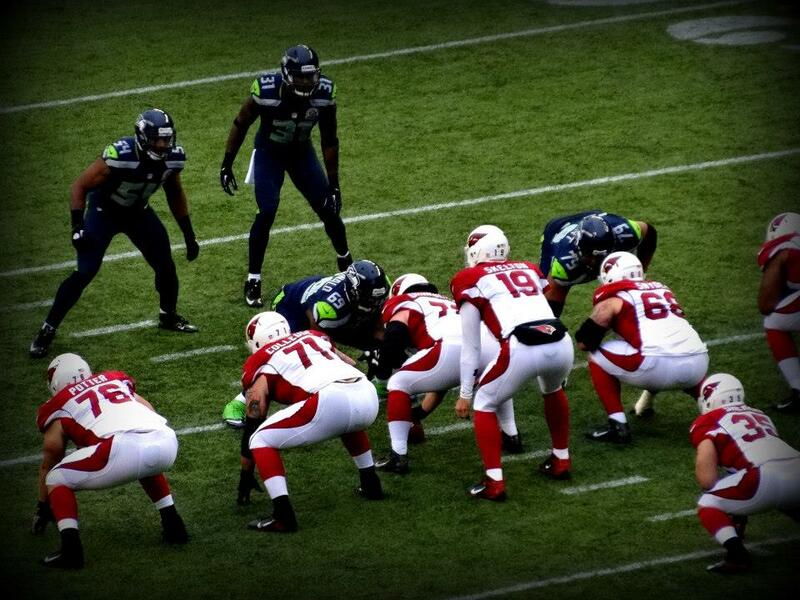 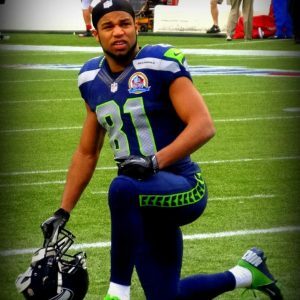 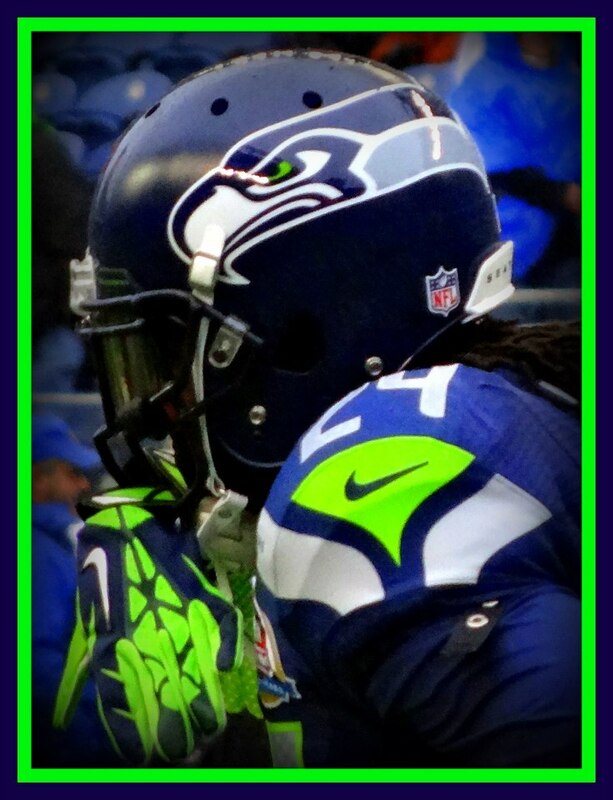 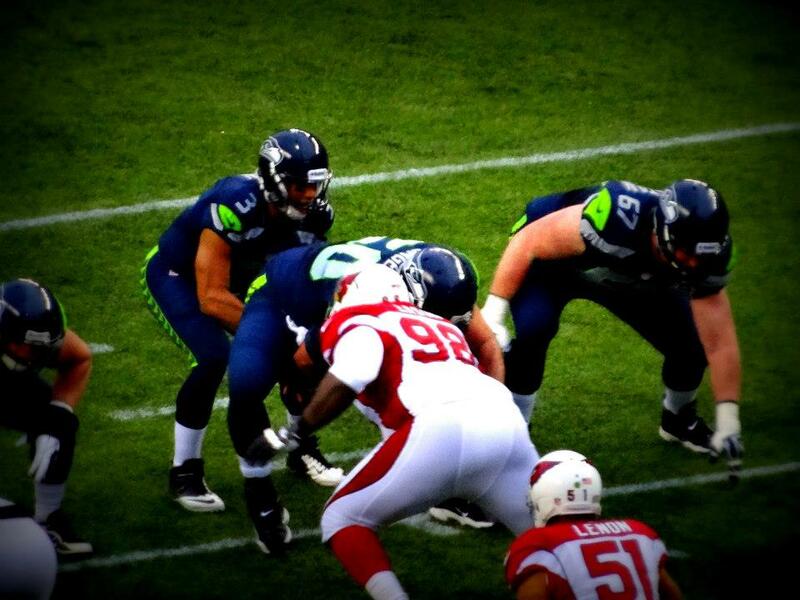 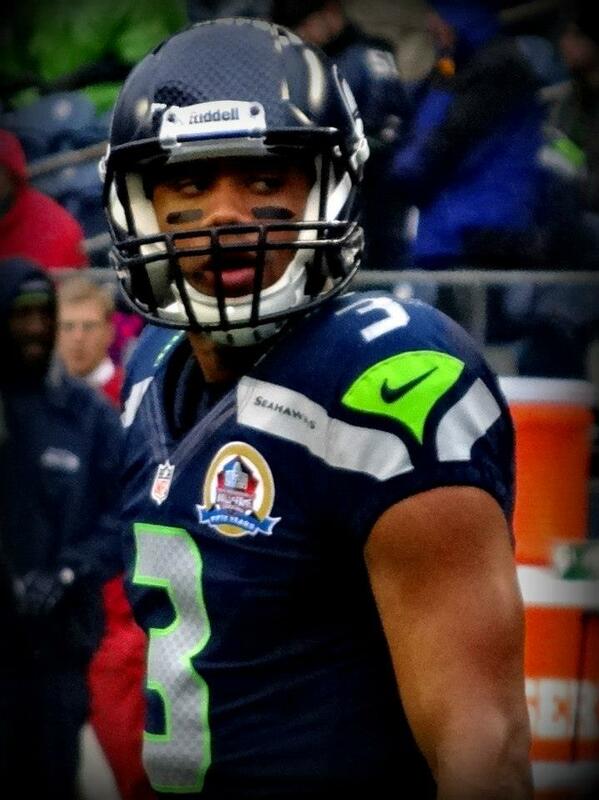 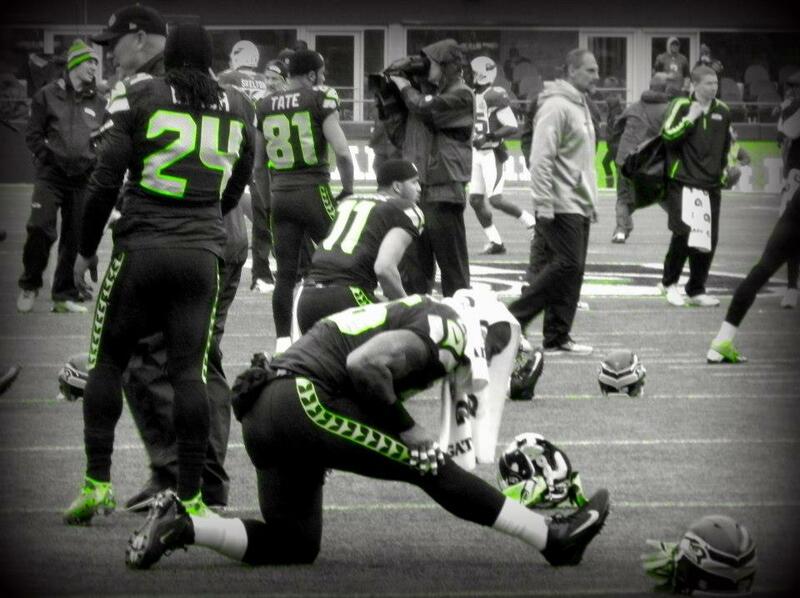 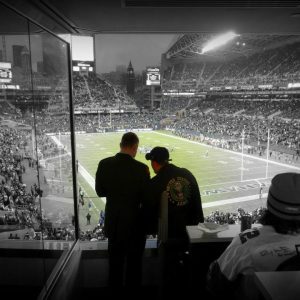 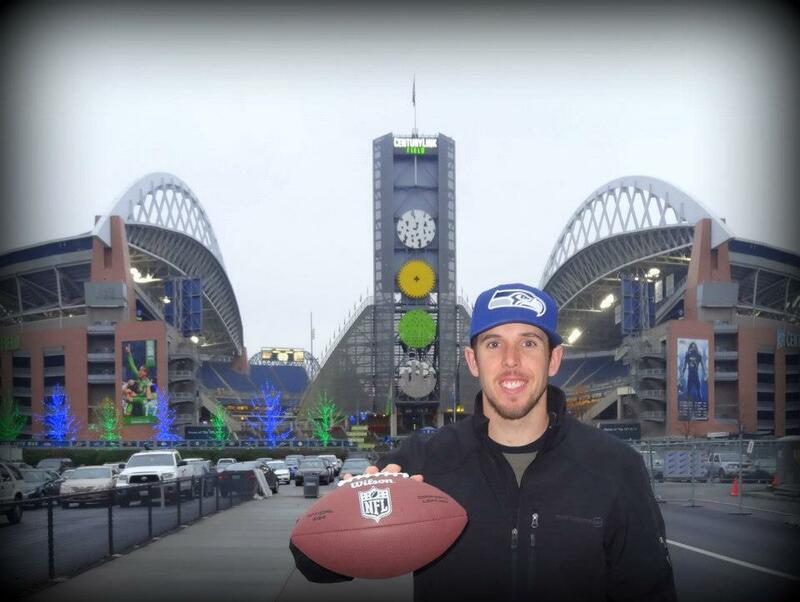 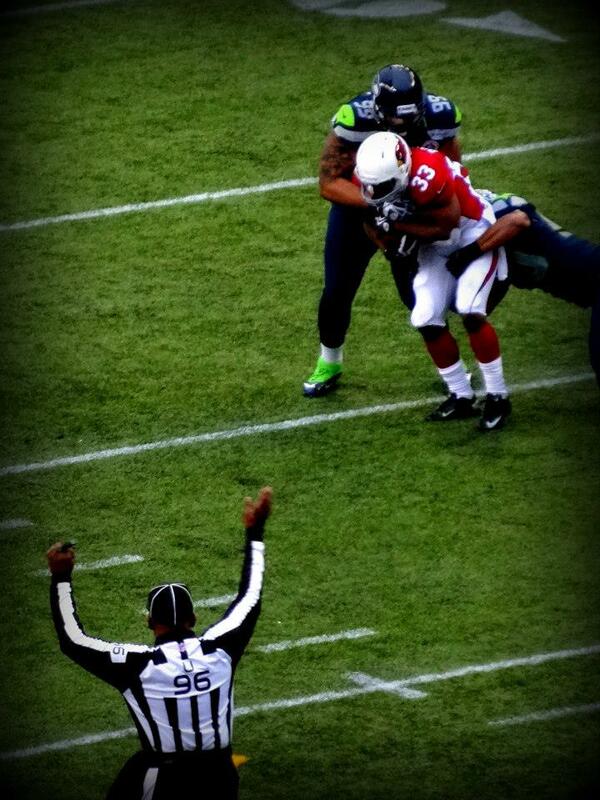 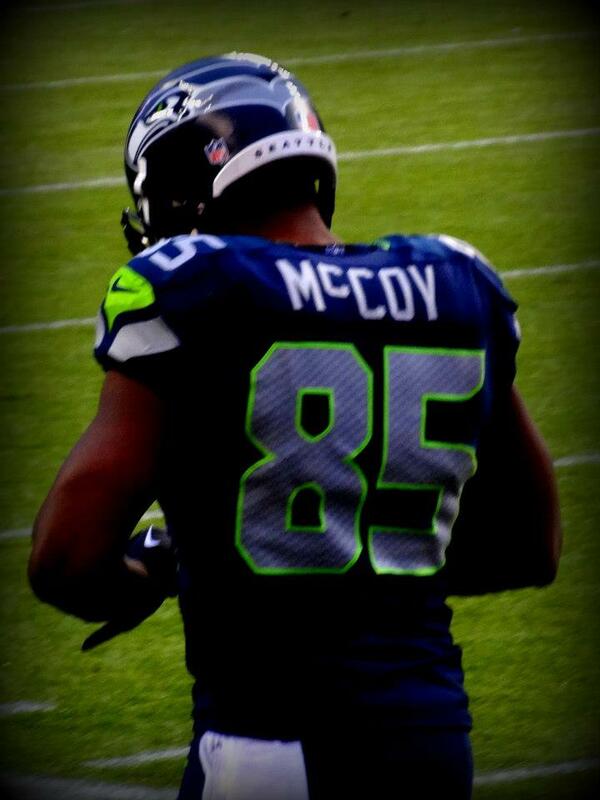 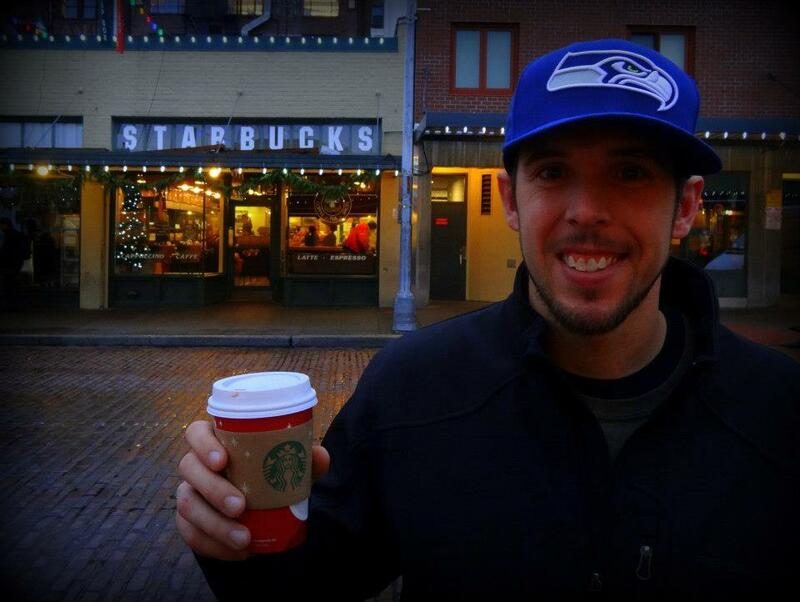 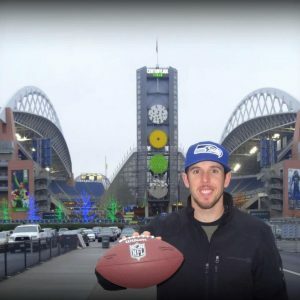 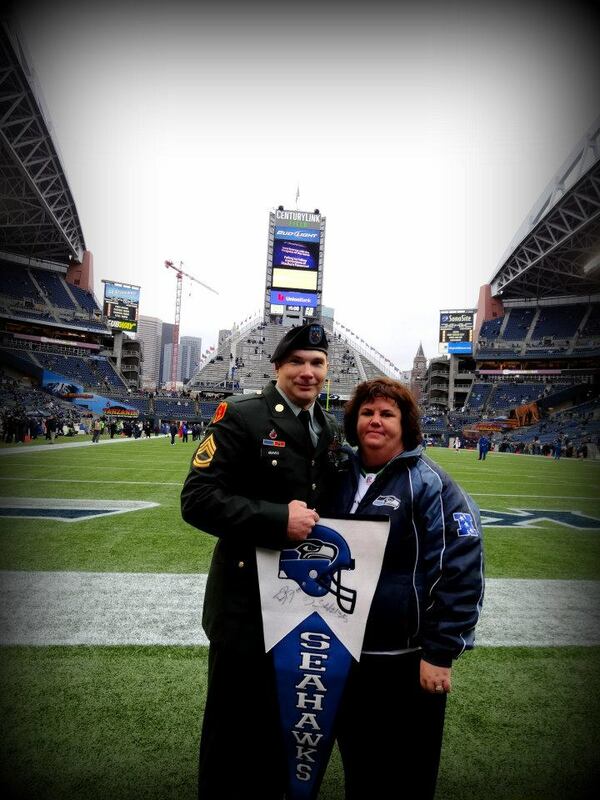 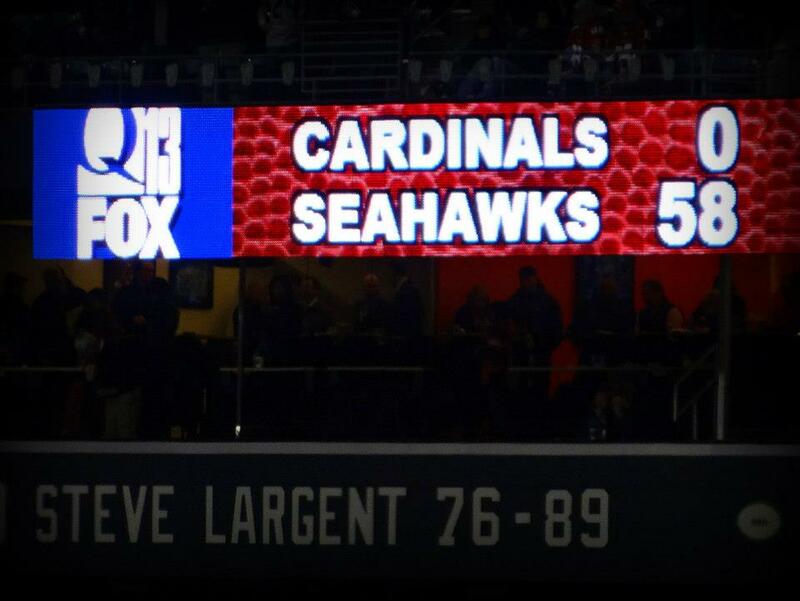 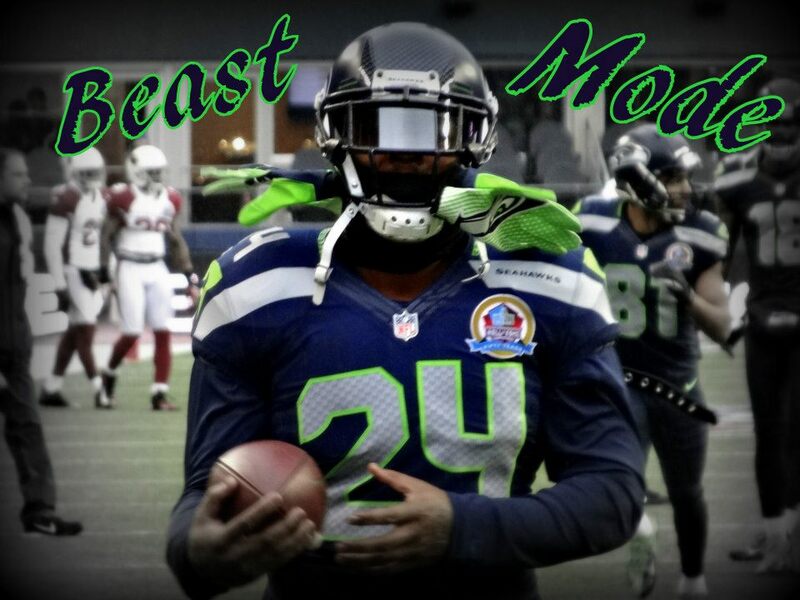 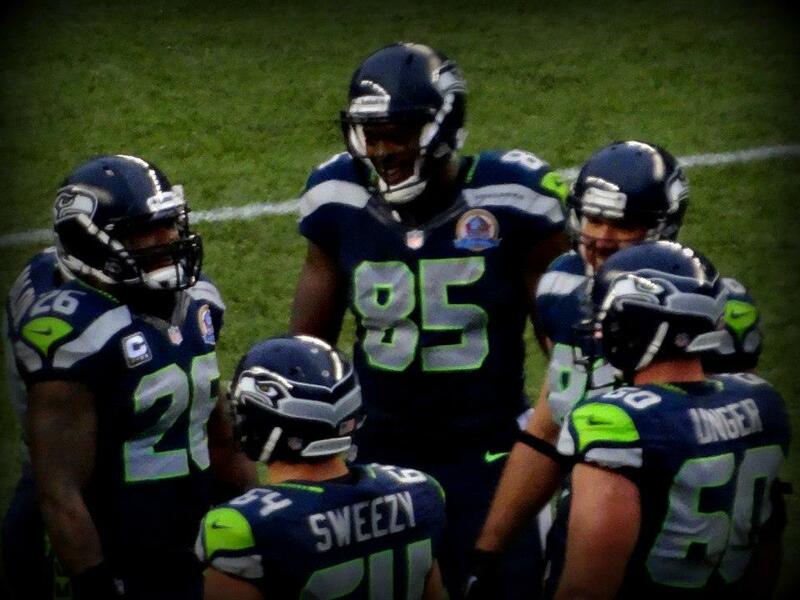 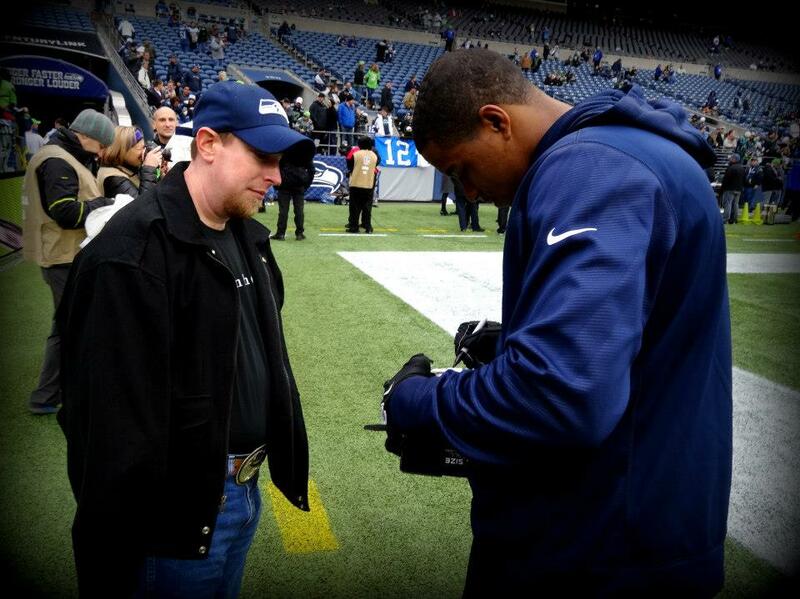 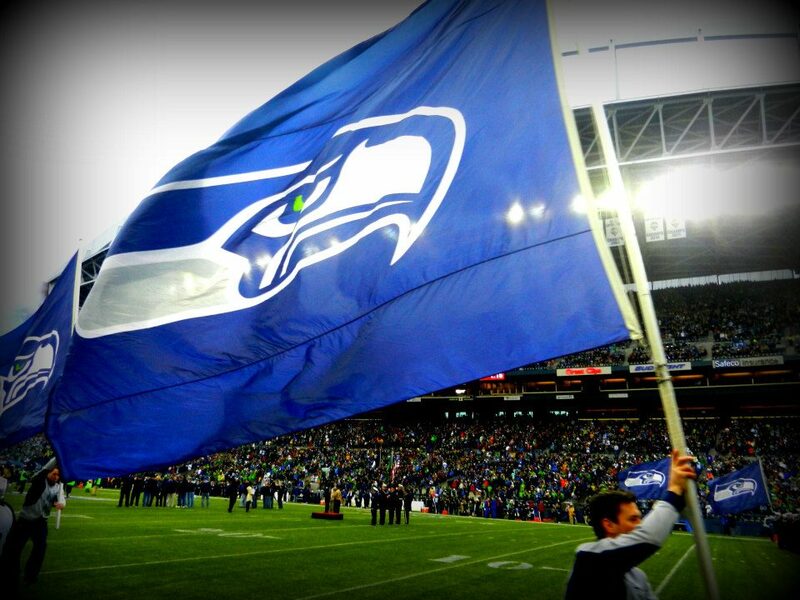 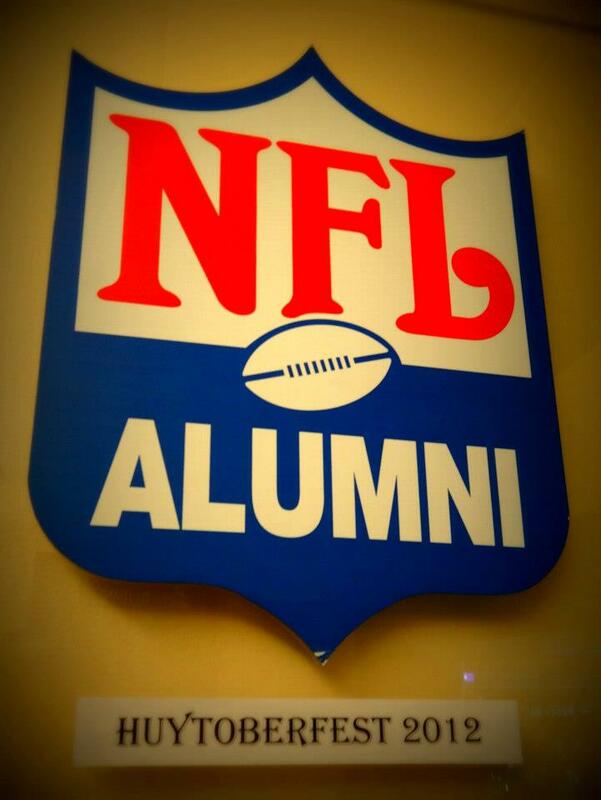 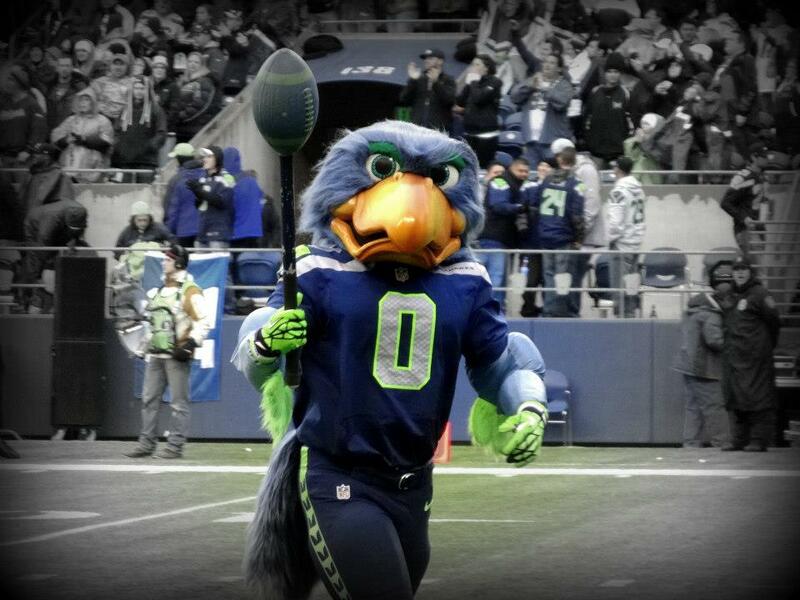 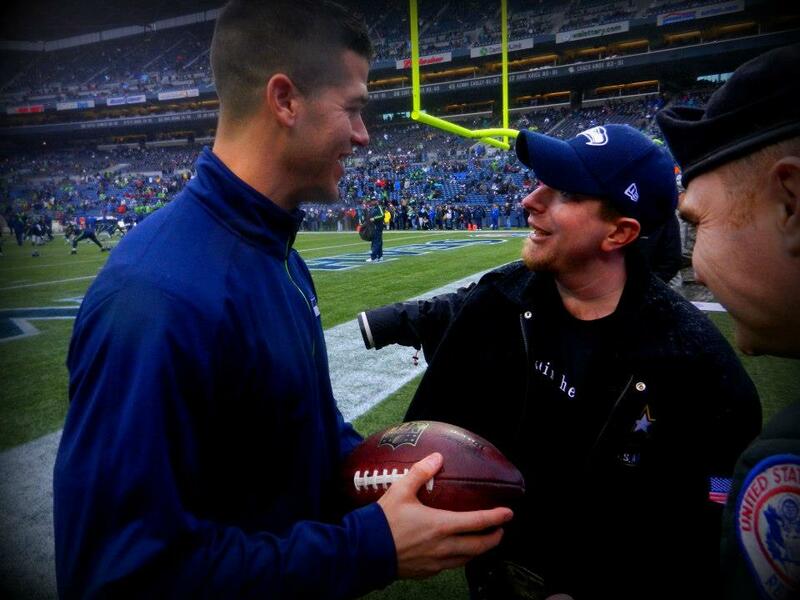 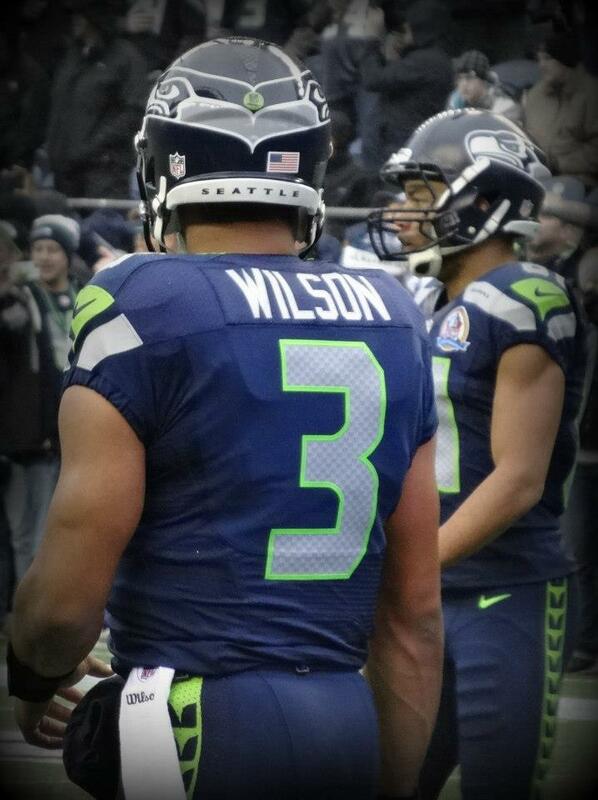 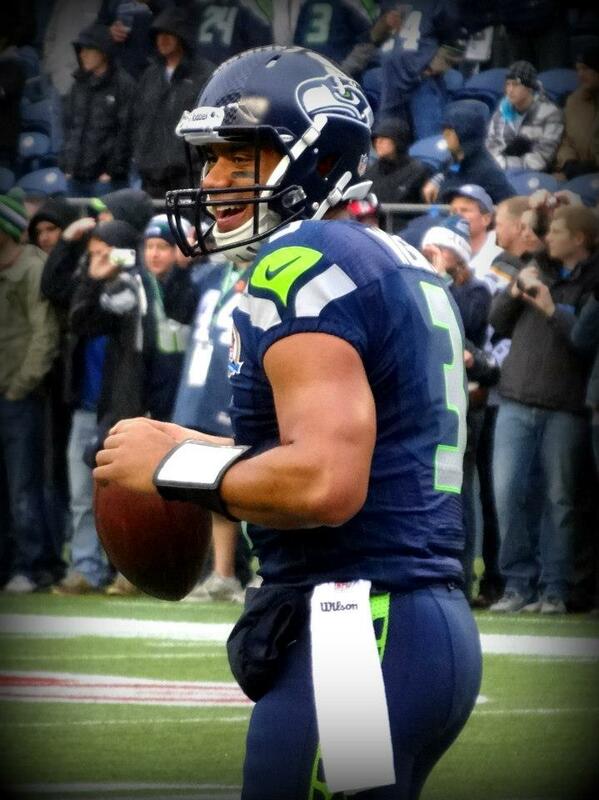 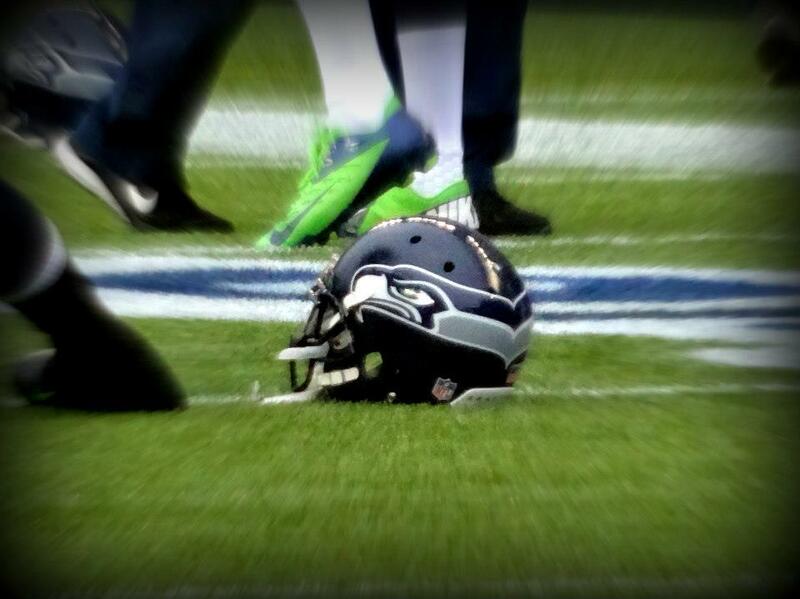 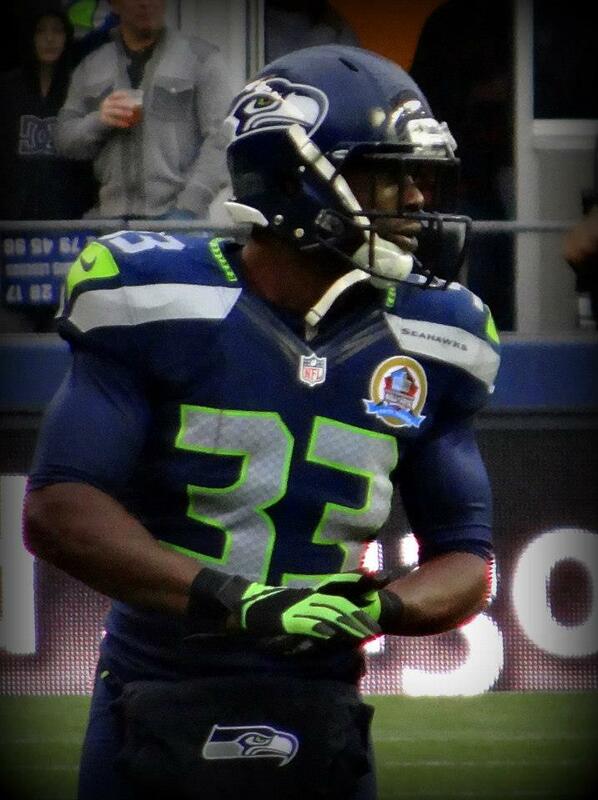 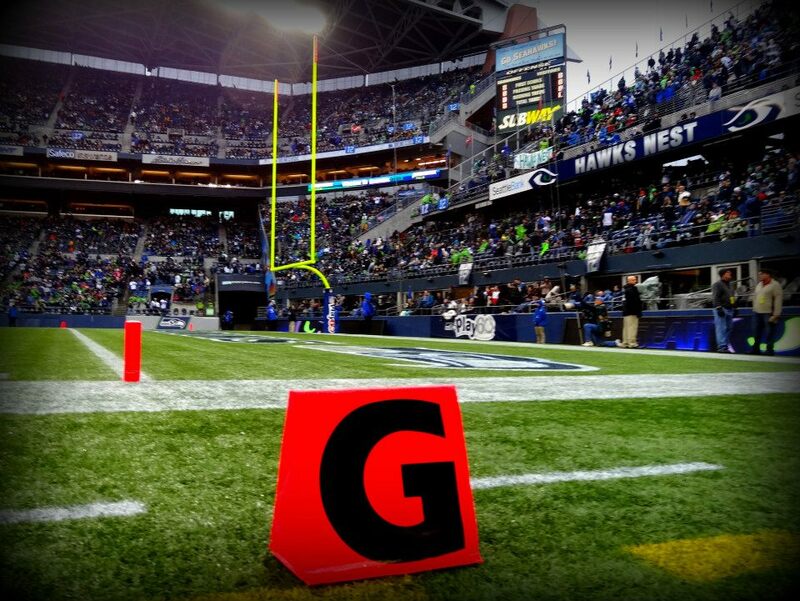 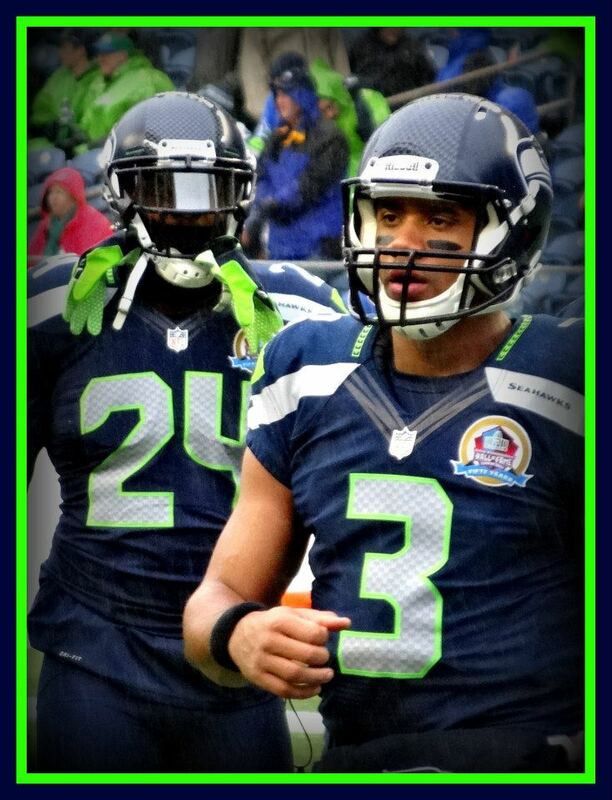 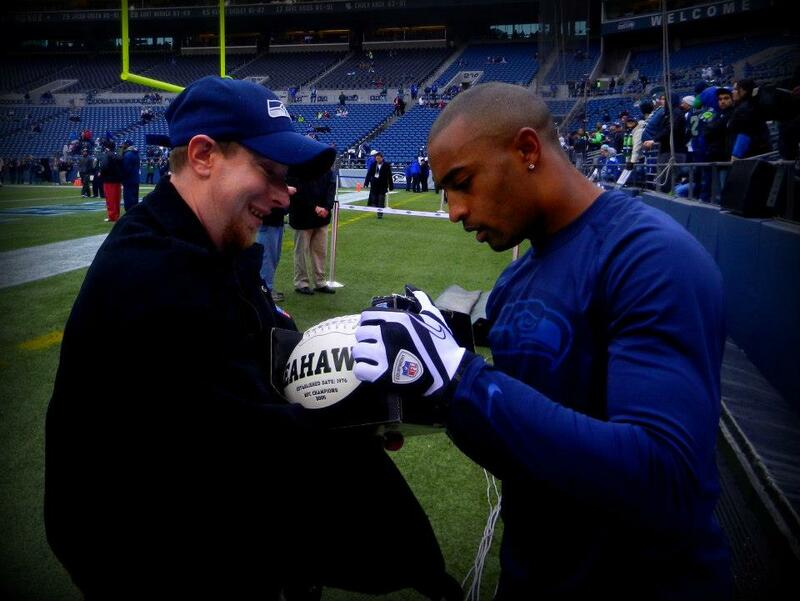 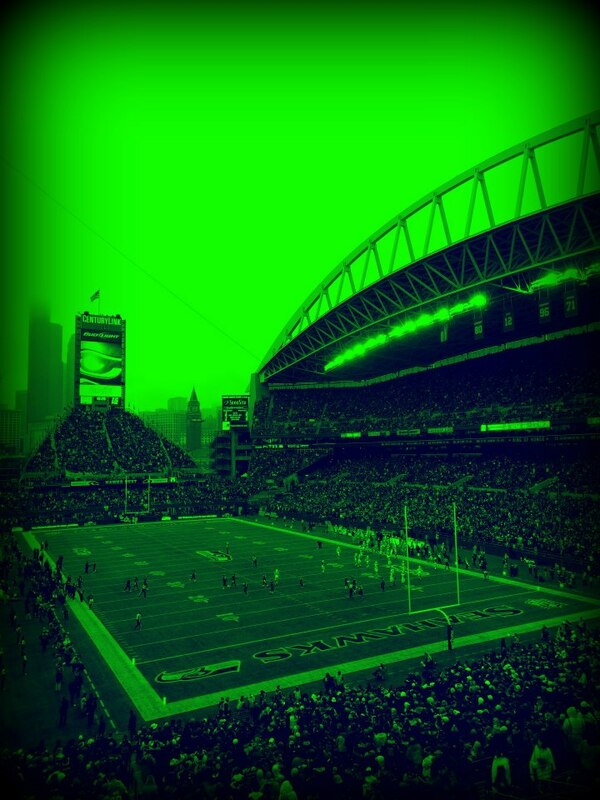 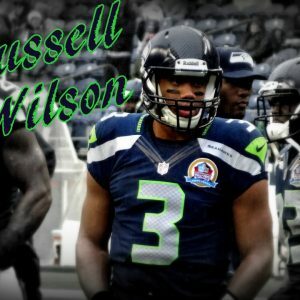 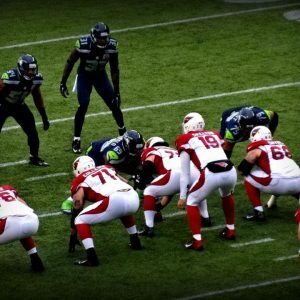 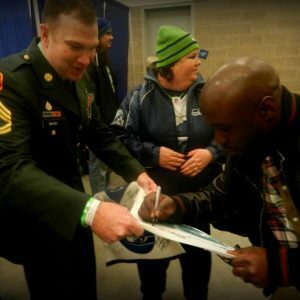 Shawn is one of the biggest Seahawks fans you will ever meet! 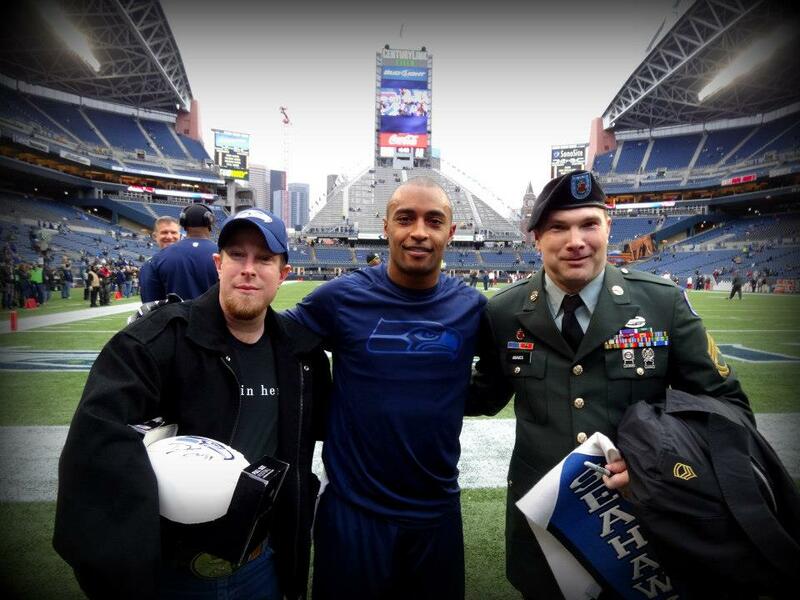 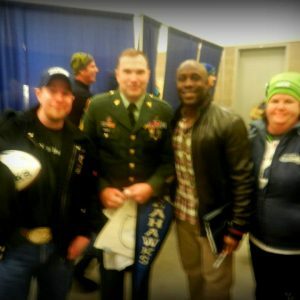 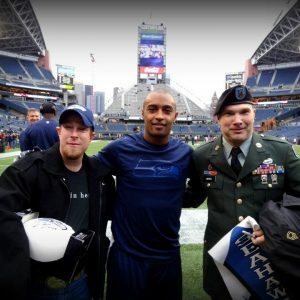 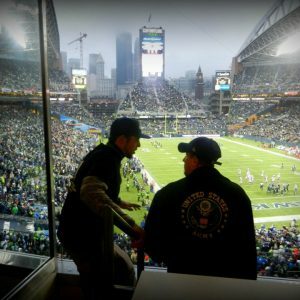 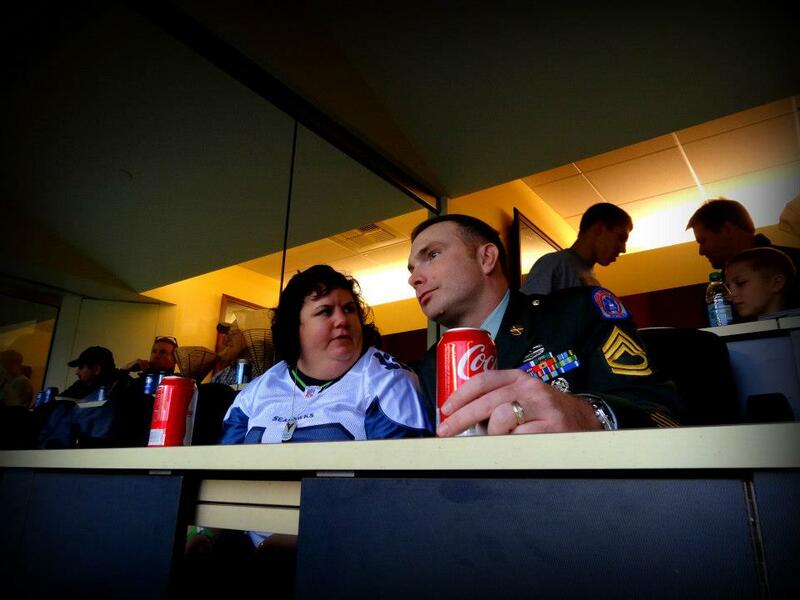 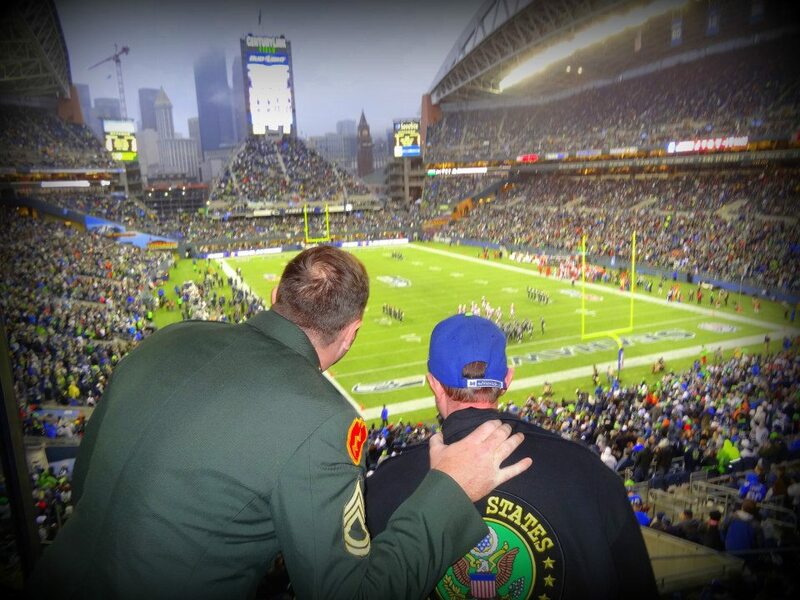 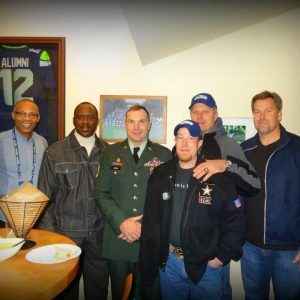 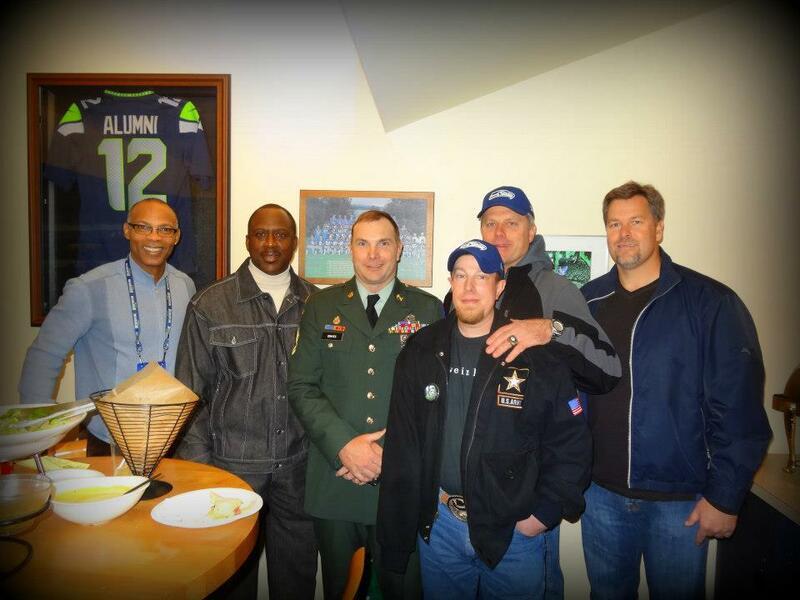 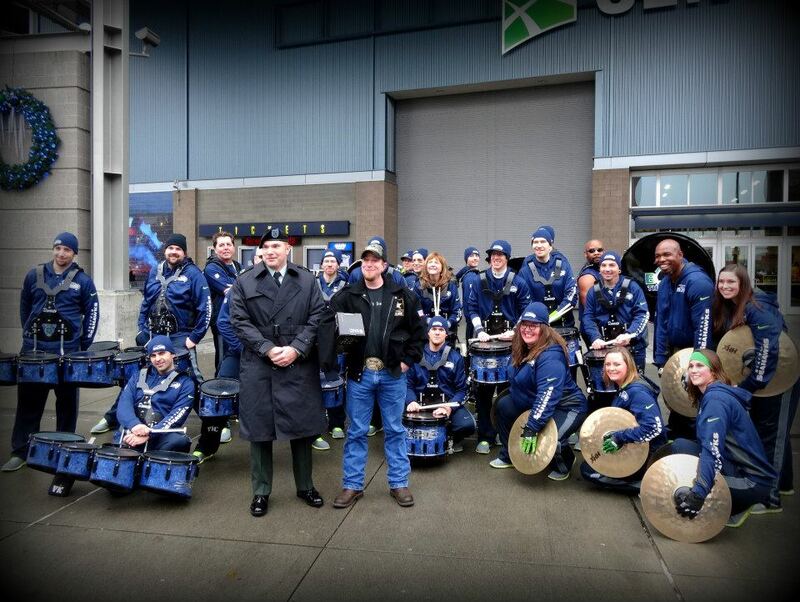 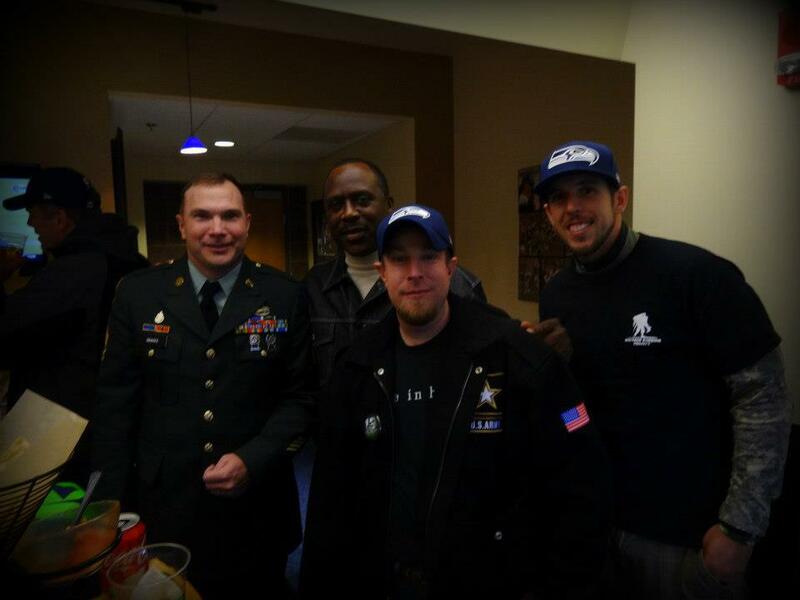 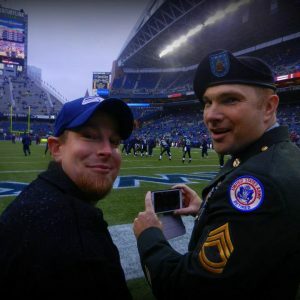 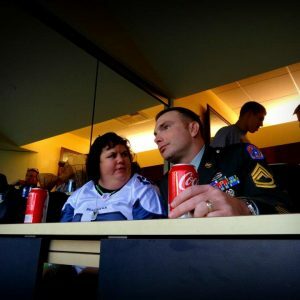 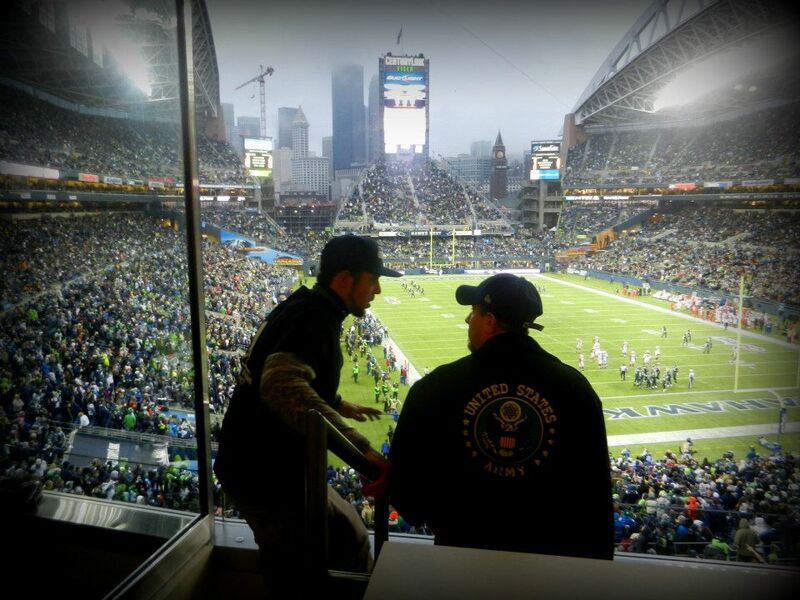 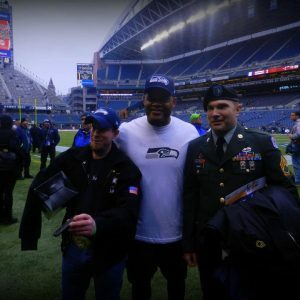 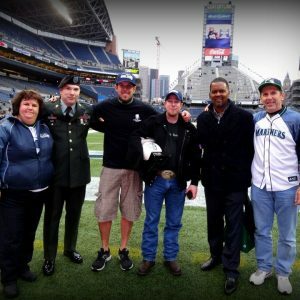 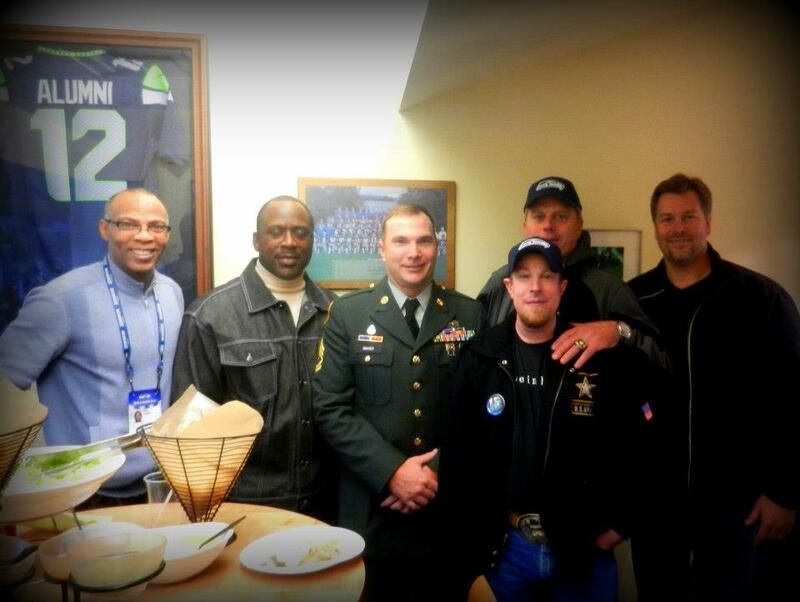 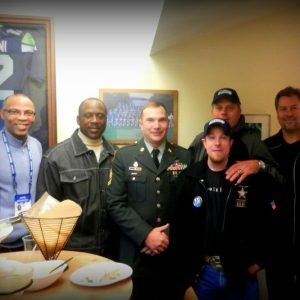 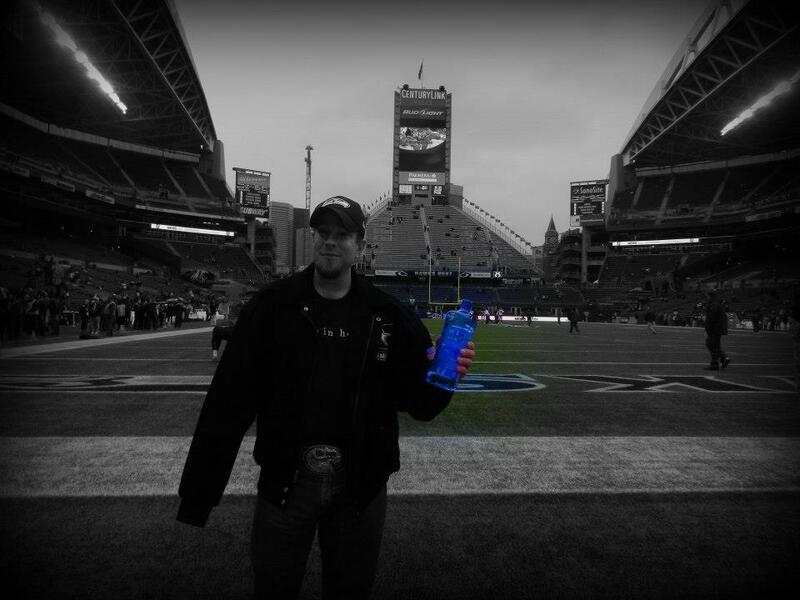 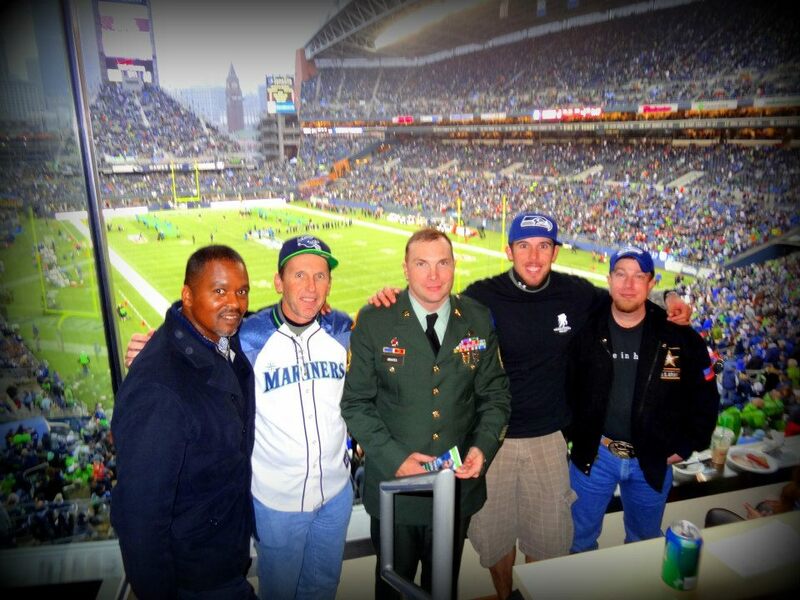 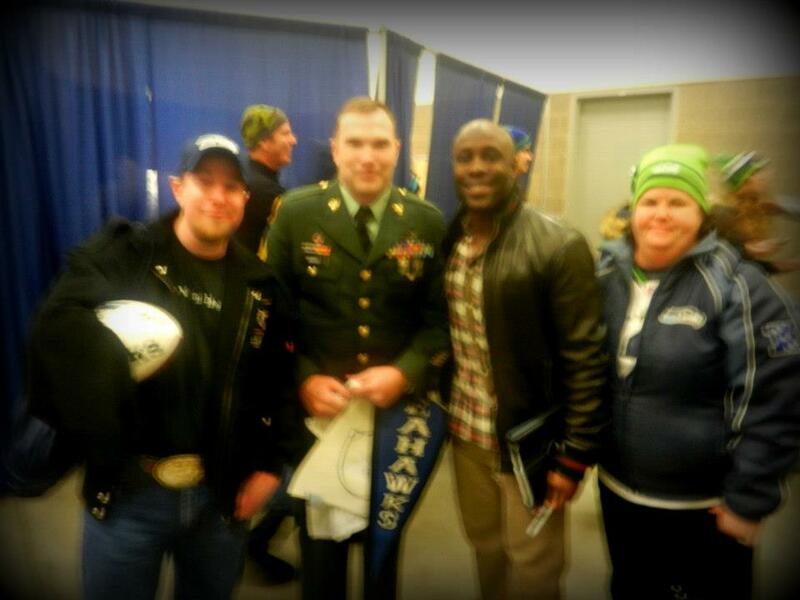 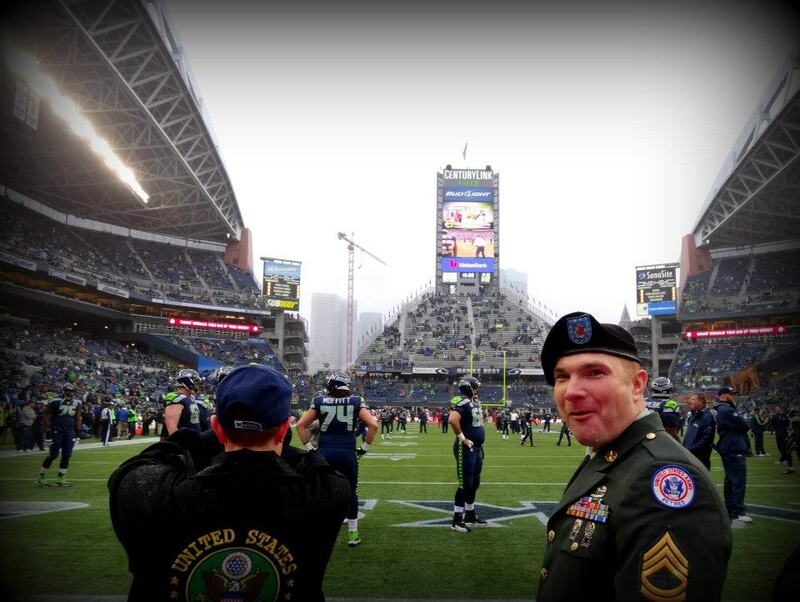 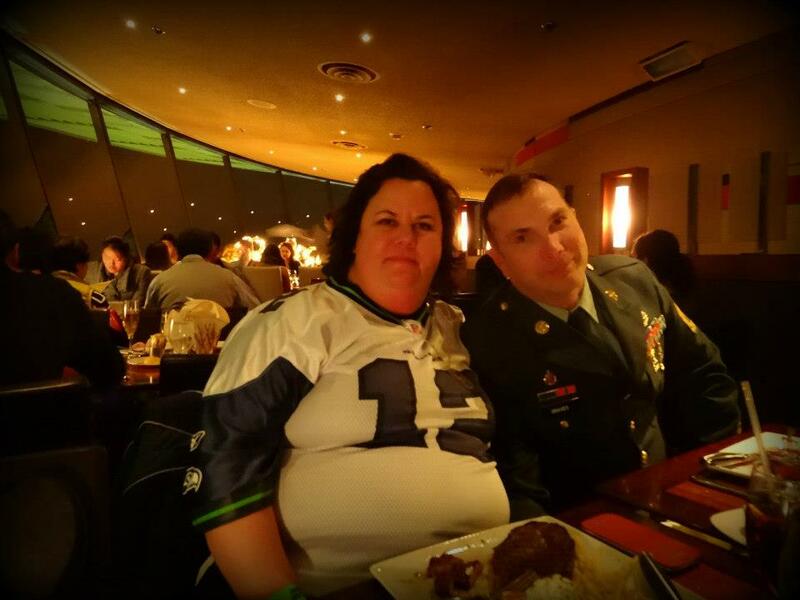 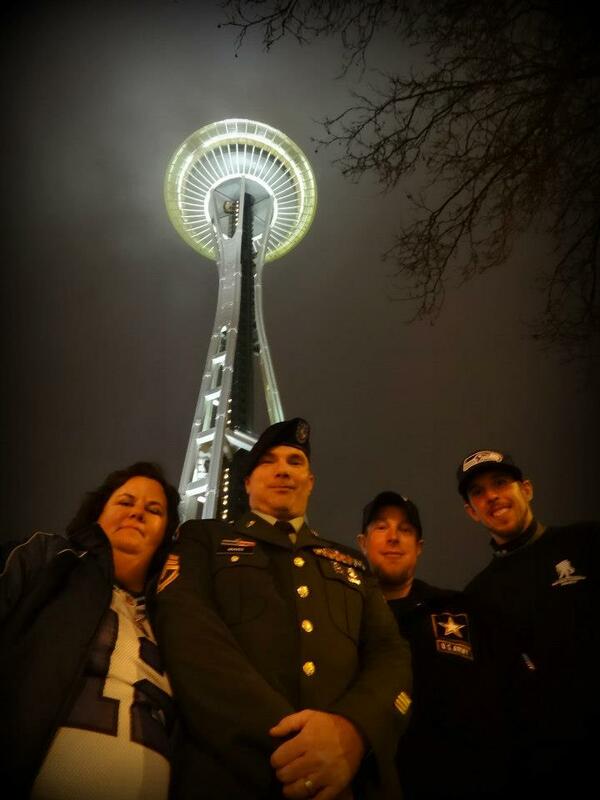 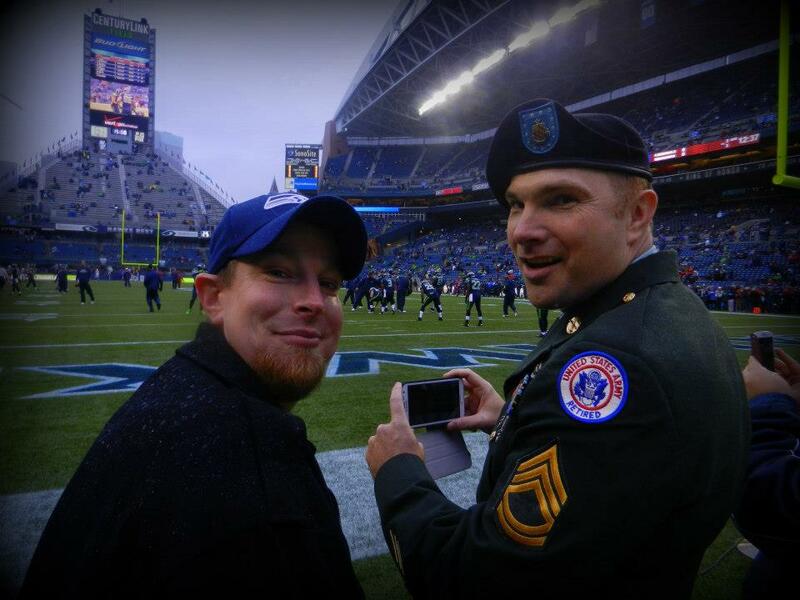 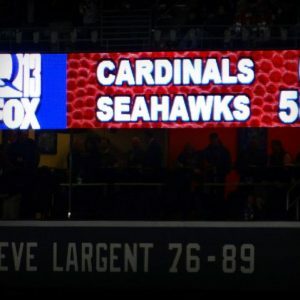 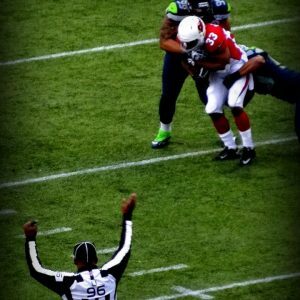 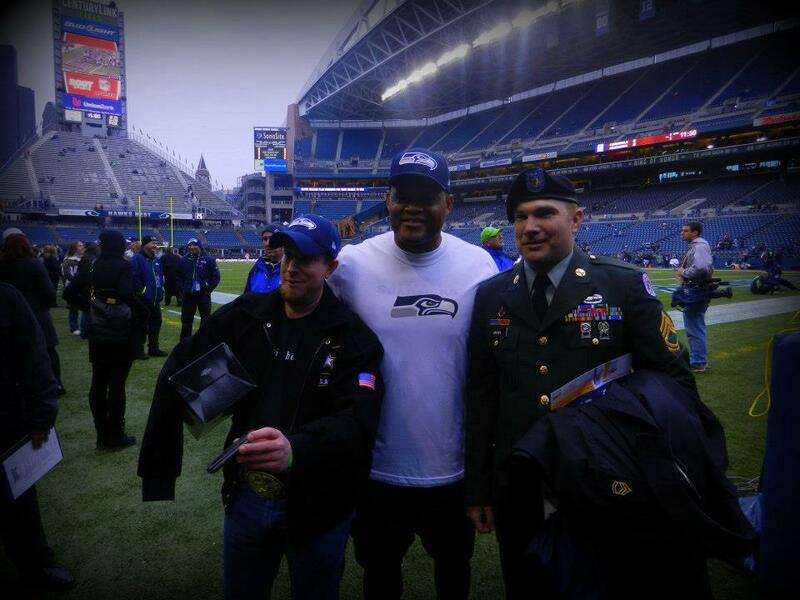 We had the honor of hosting Shawn & Army warrior Trevor Phillips at the Seahawks game as they beat the cardinals by the score of 58-0!!! 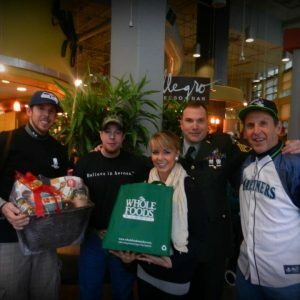 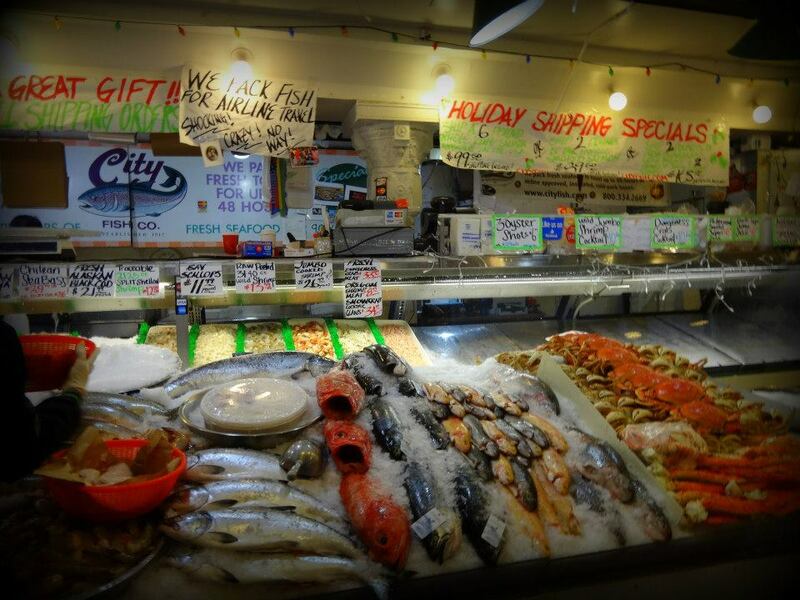 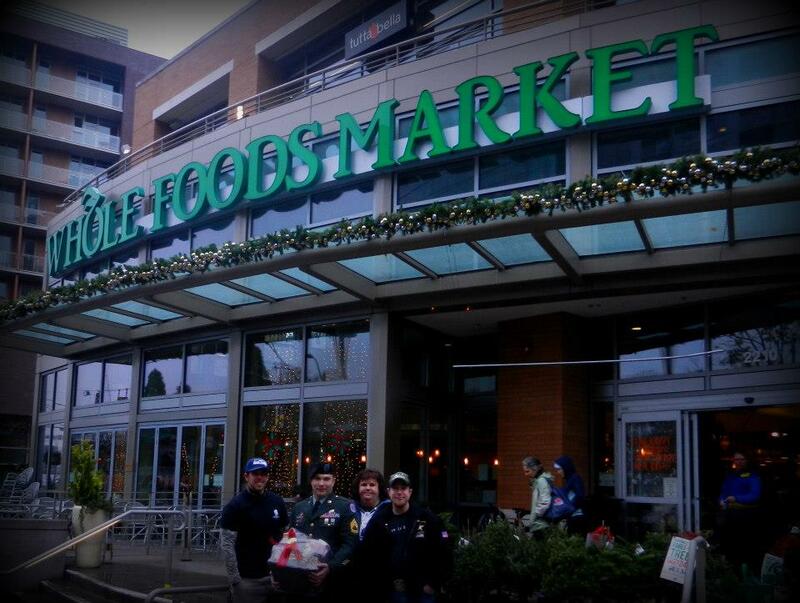 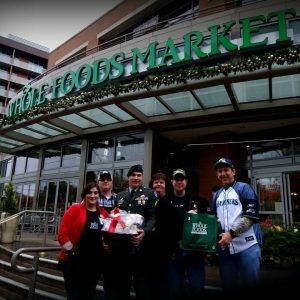 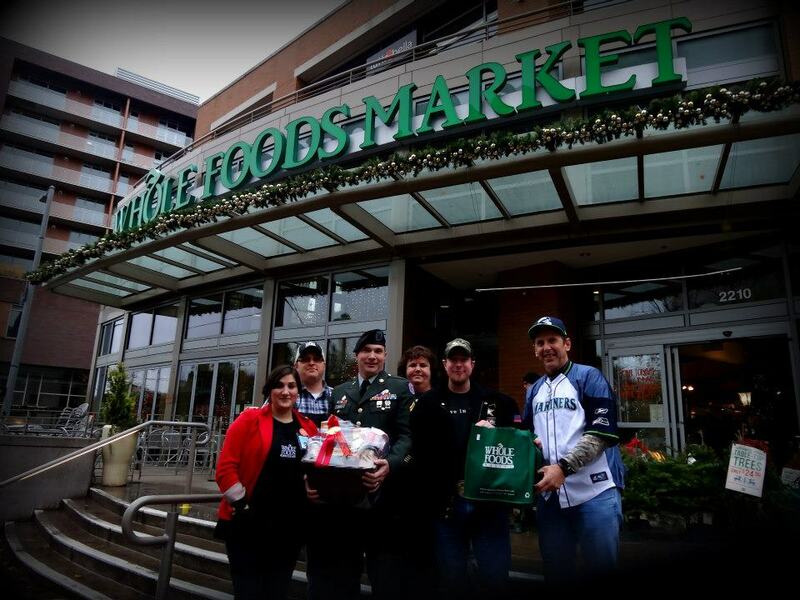 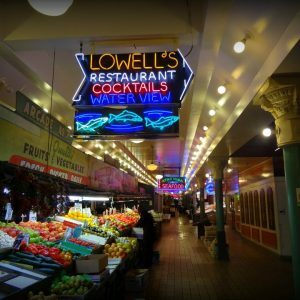 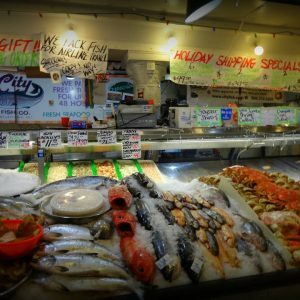 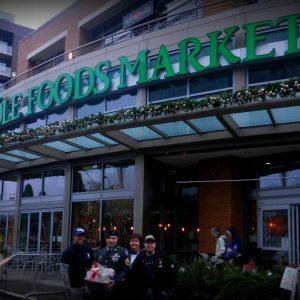 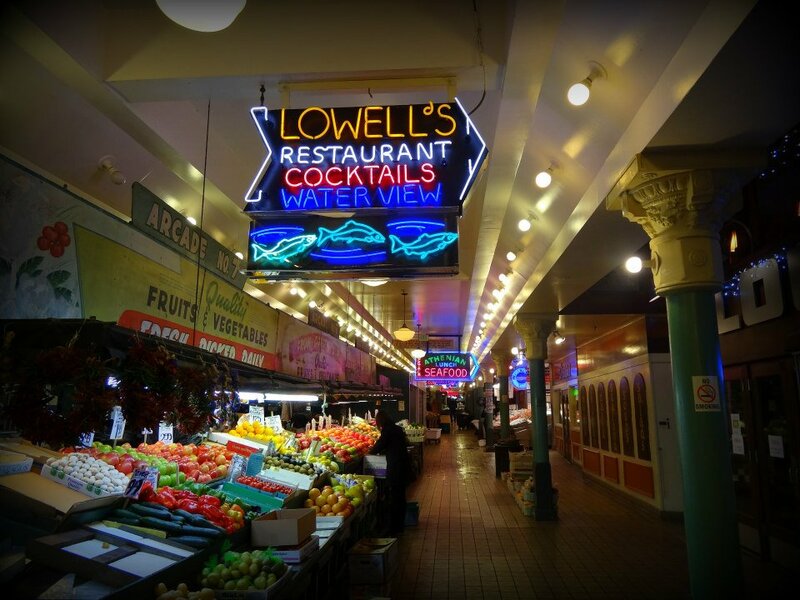 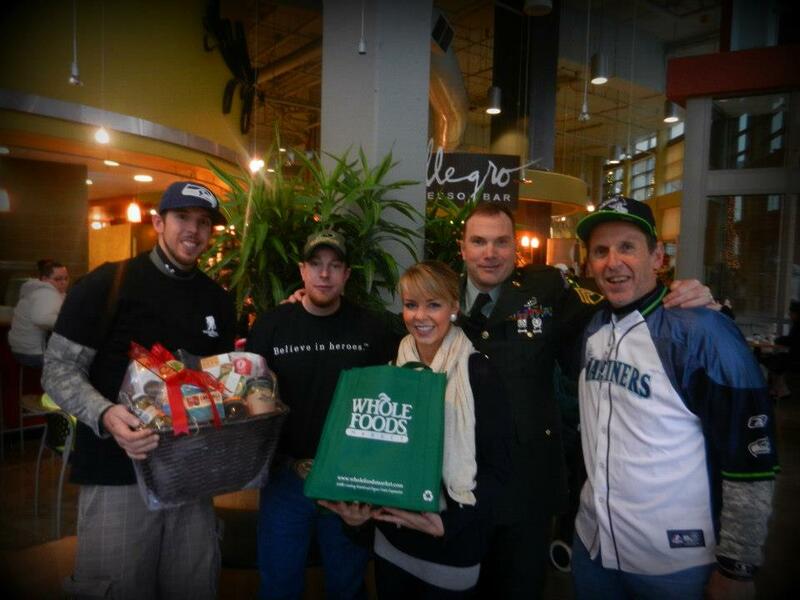 We would like to thank Whole Foods Market South Lake Union for providing a pregame meal for the warriors. 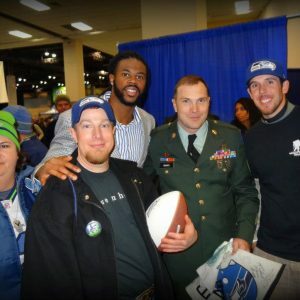 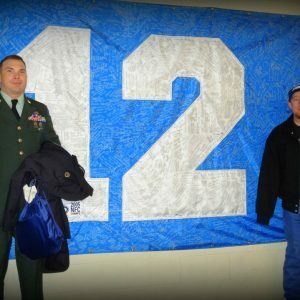 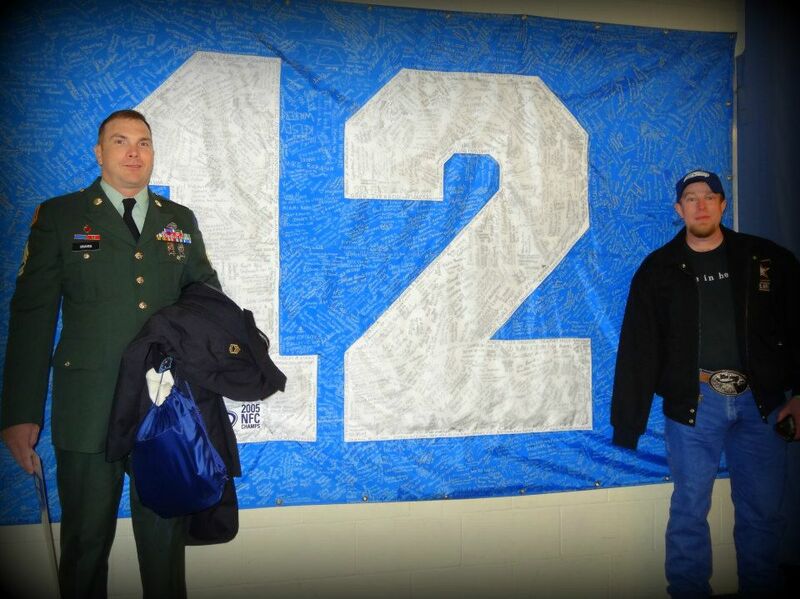 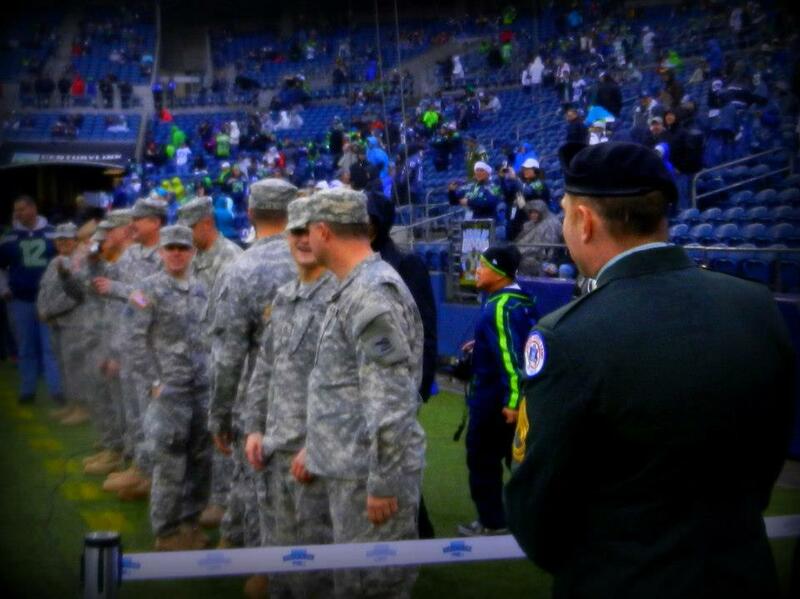 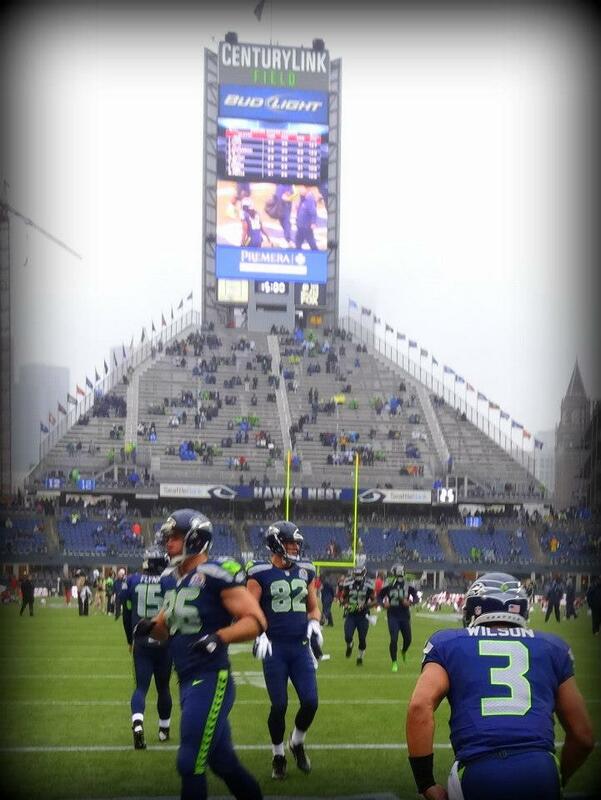 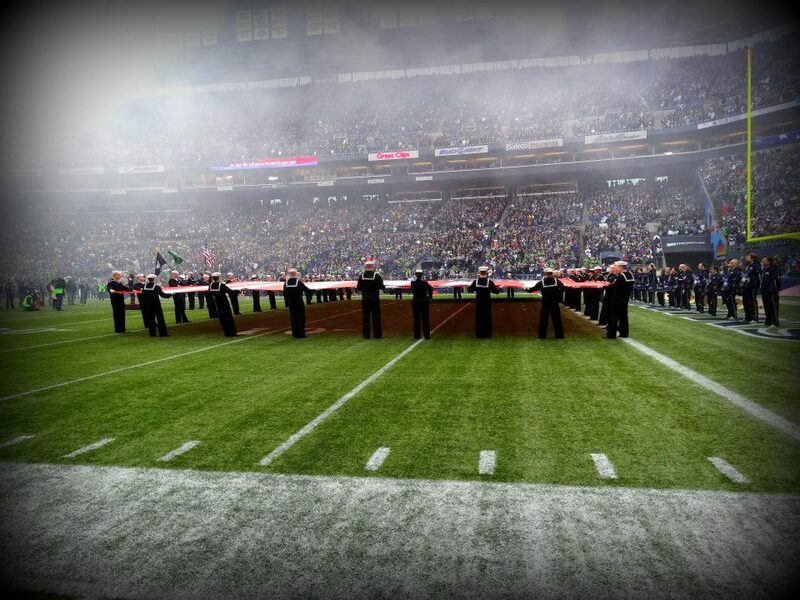 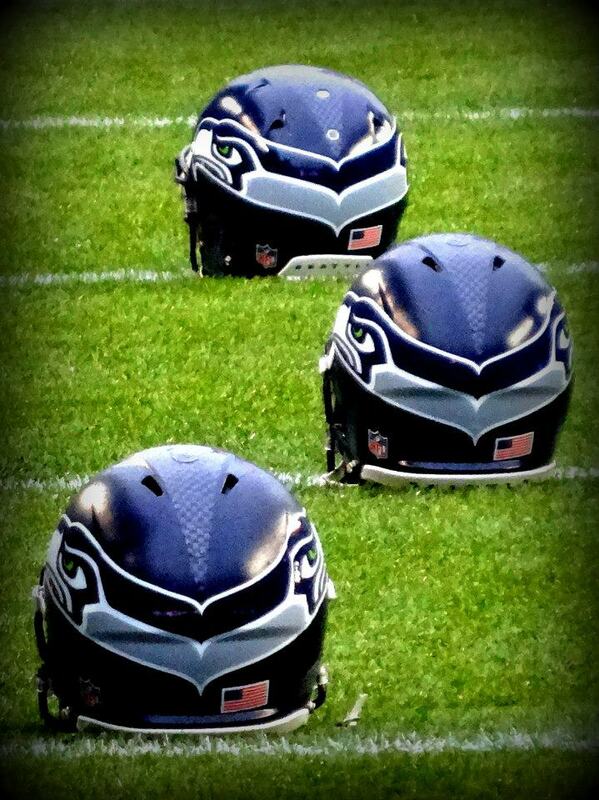 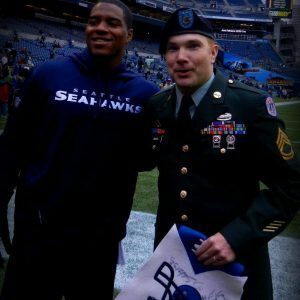 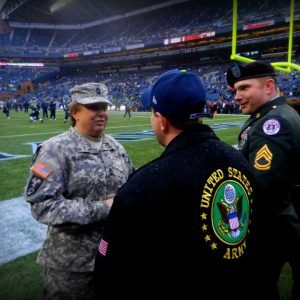 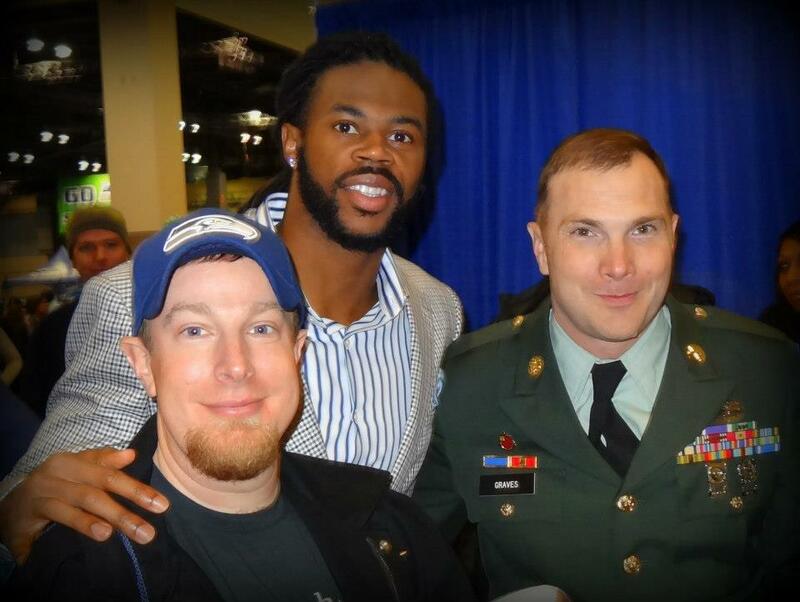 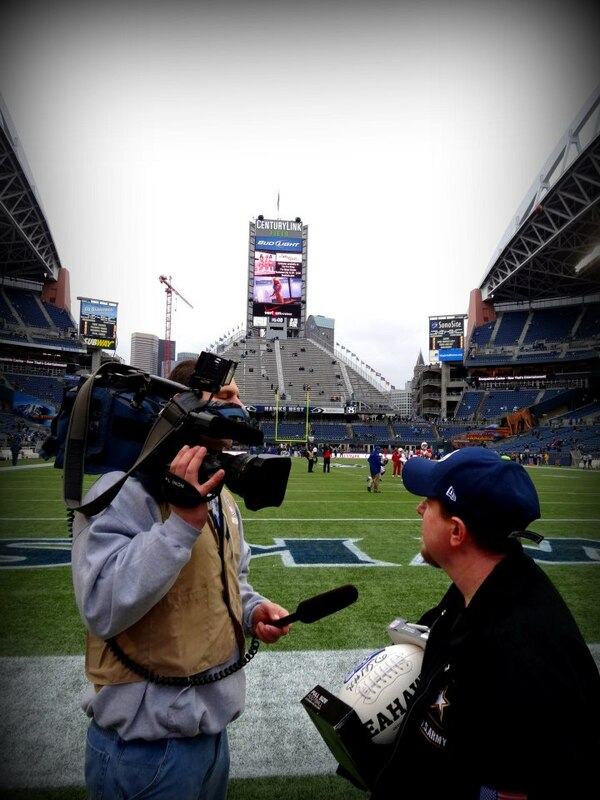 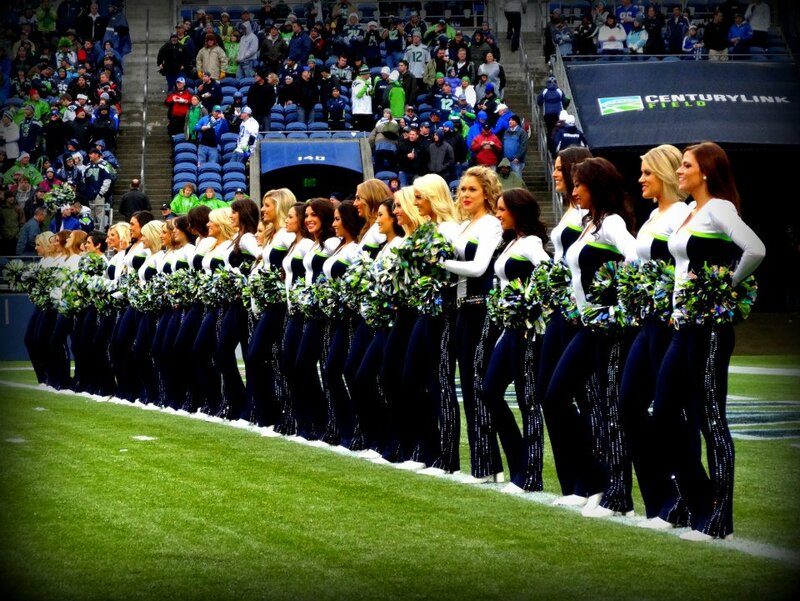 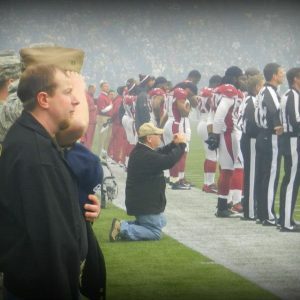 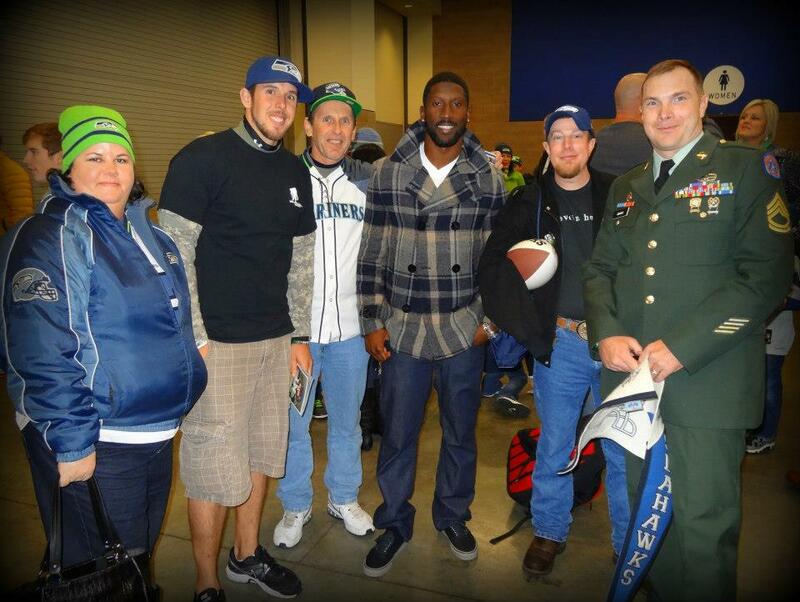 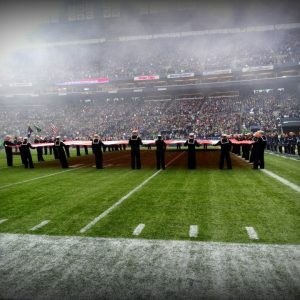 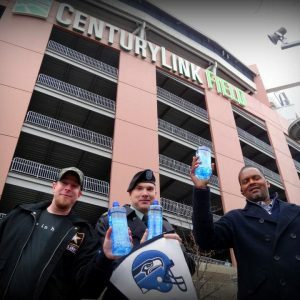 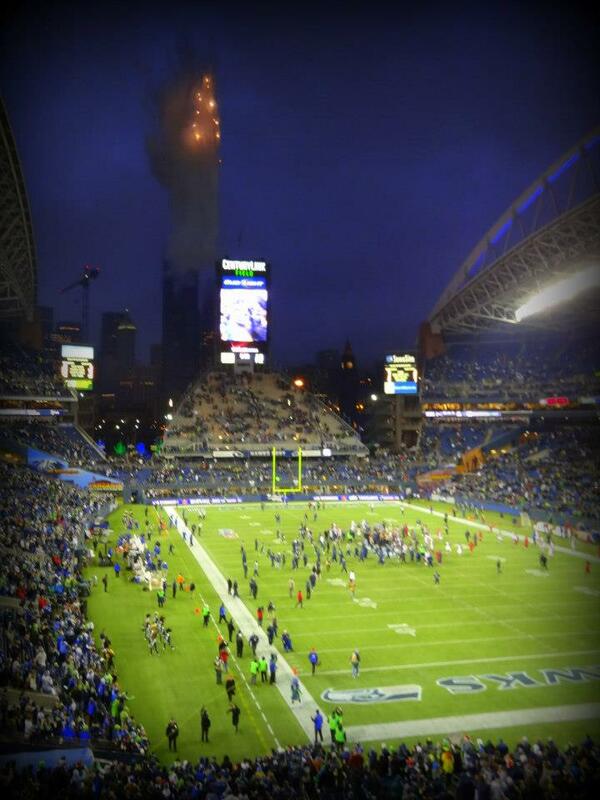 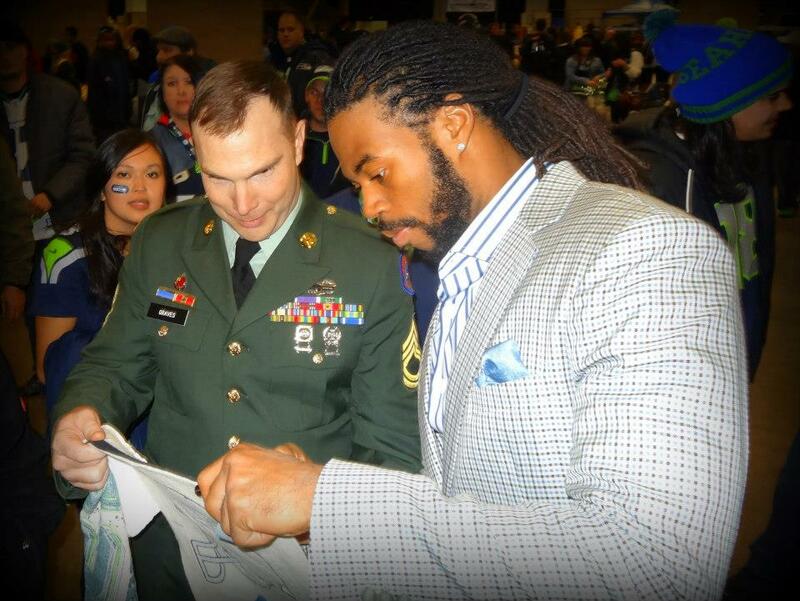 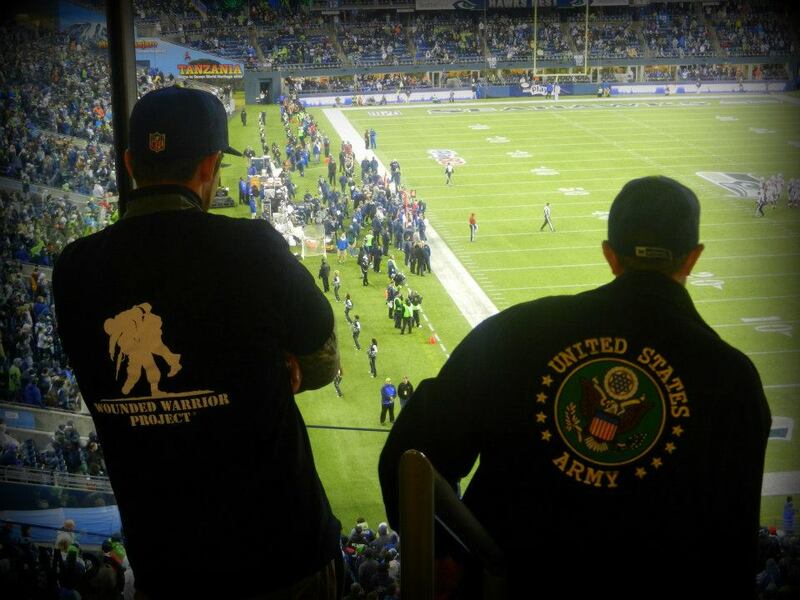 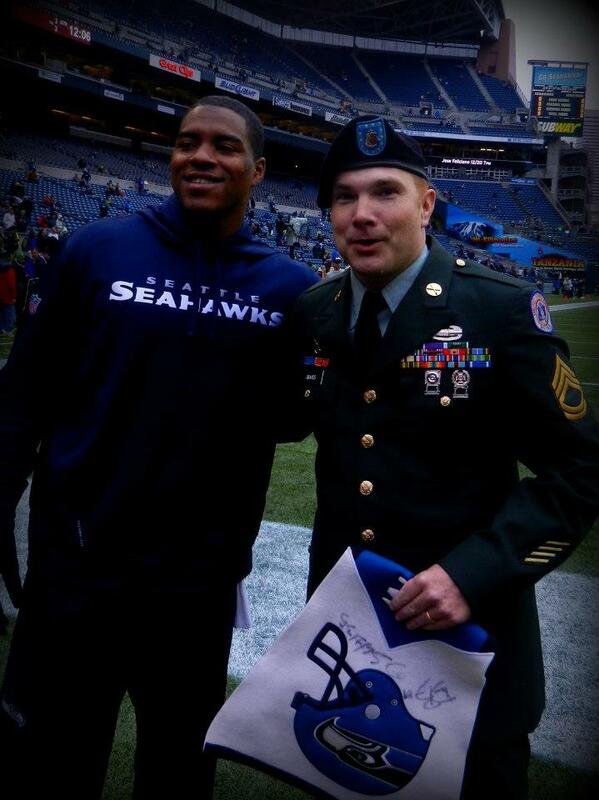 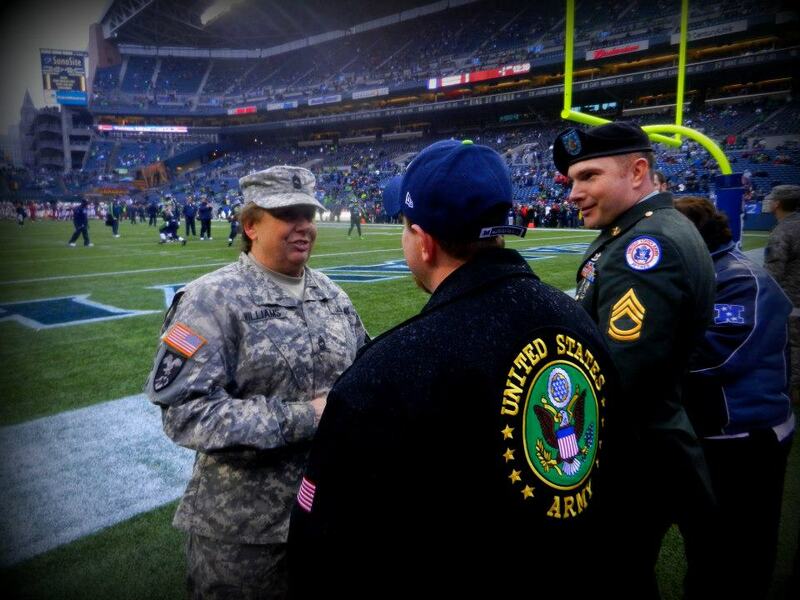 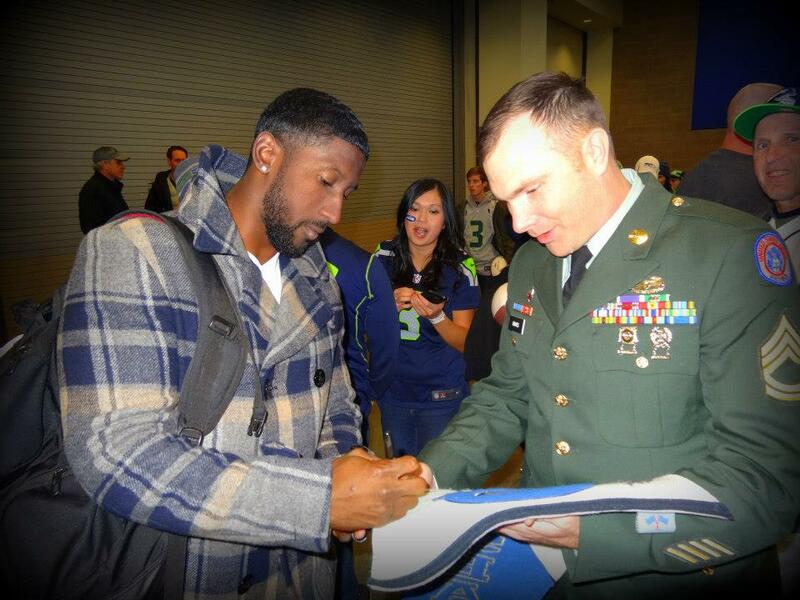 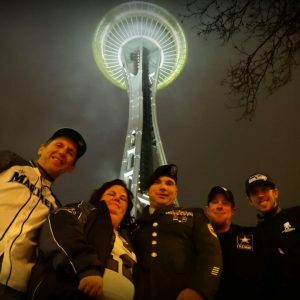 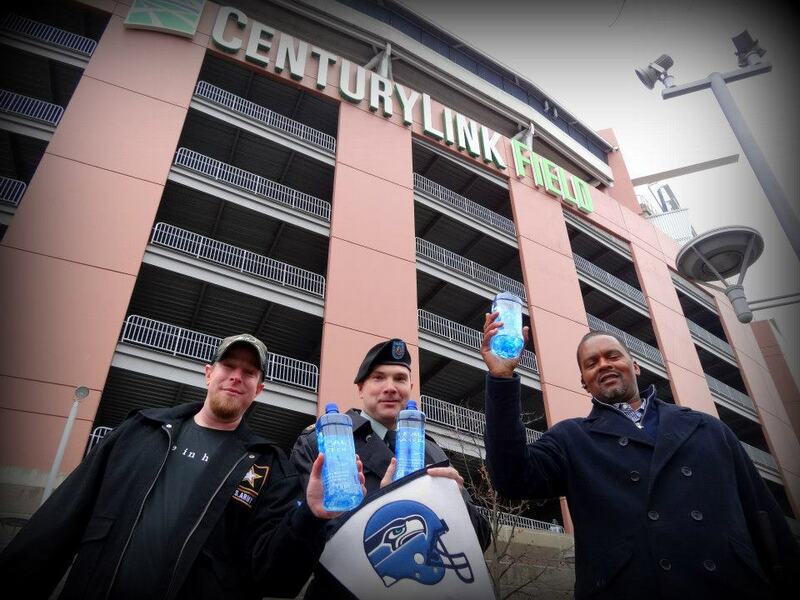 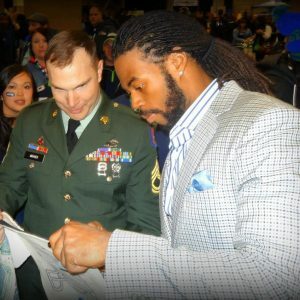 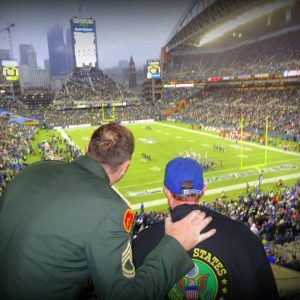 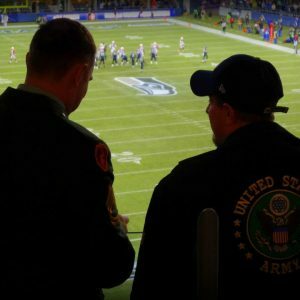 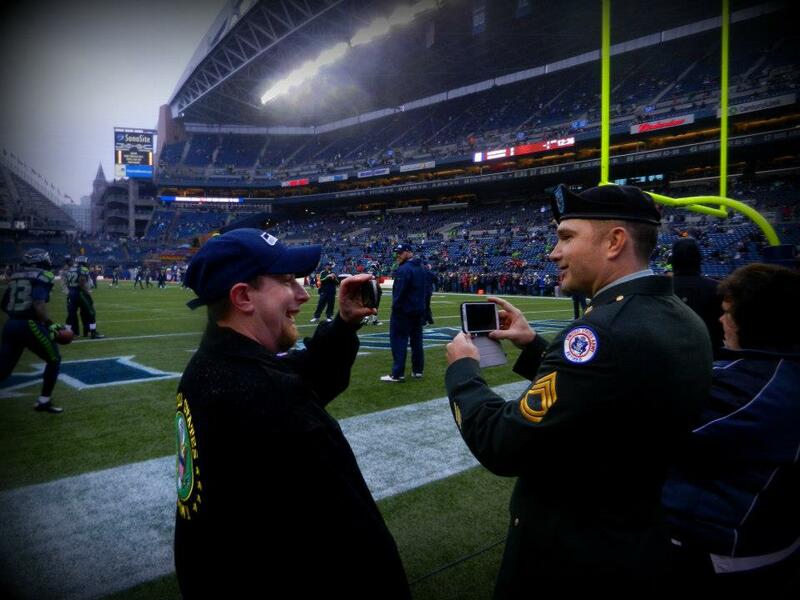 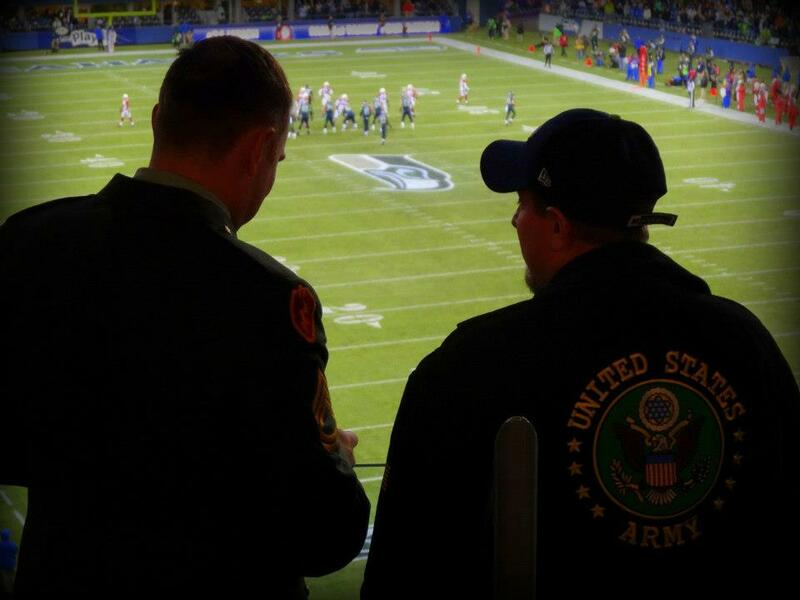 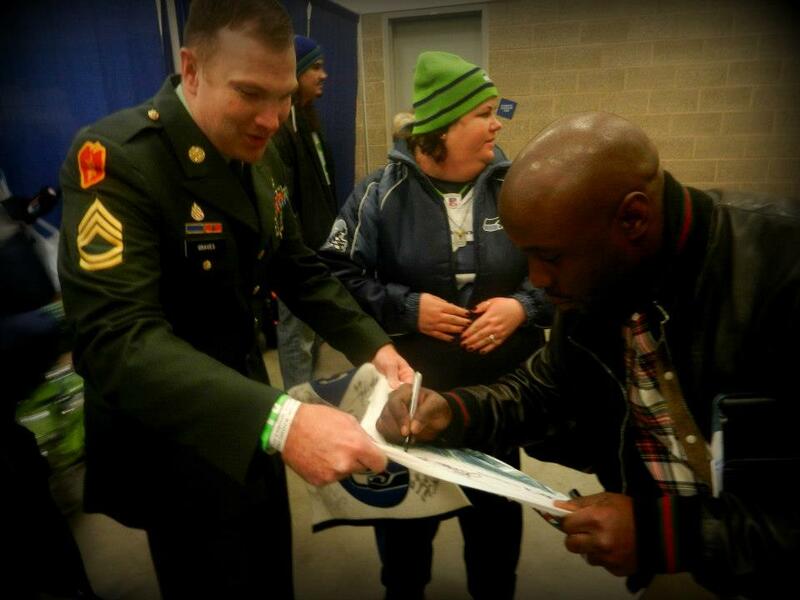 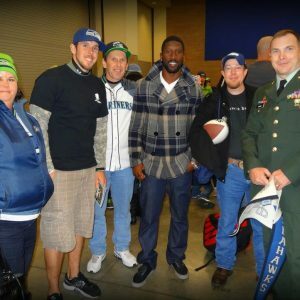 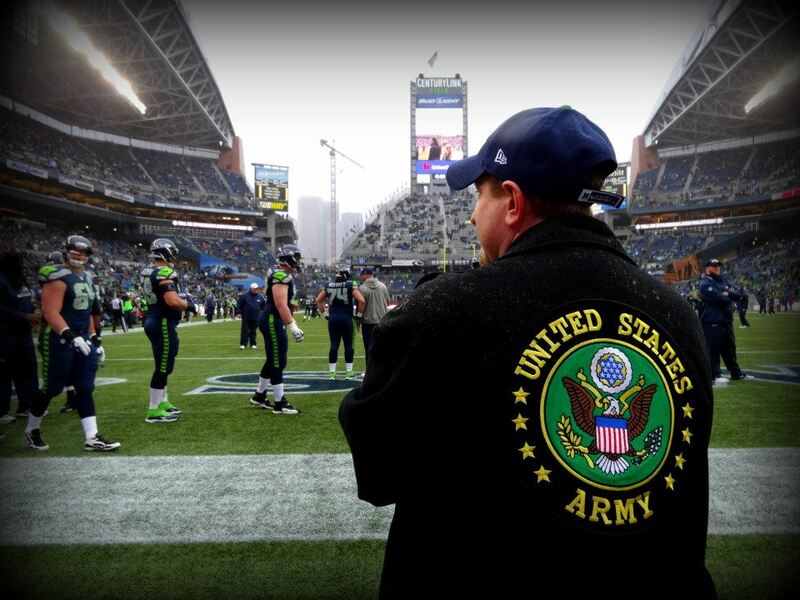 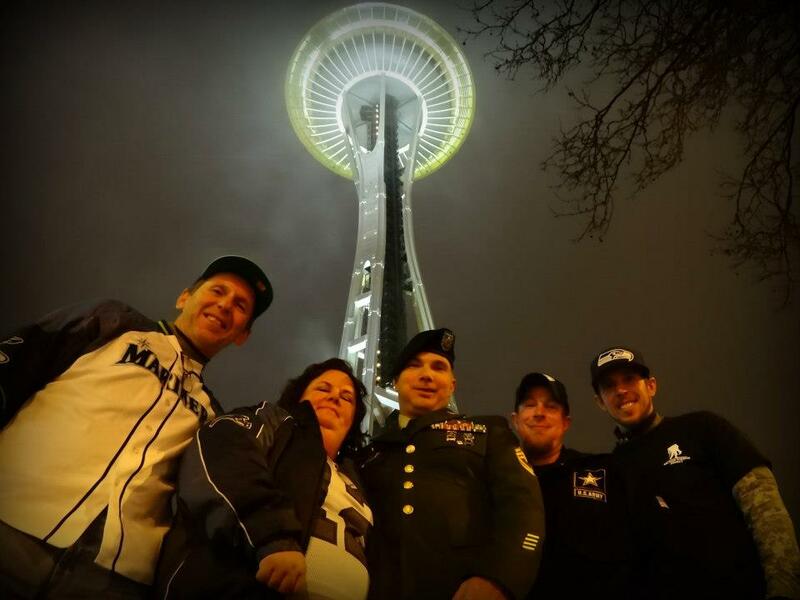 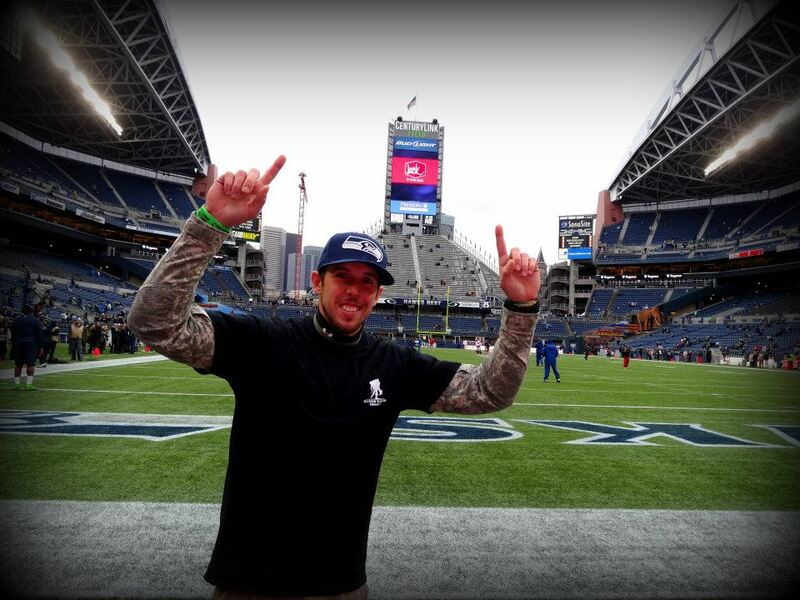 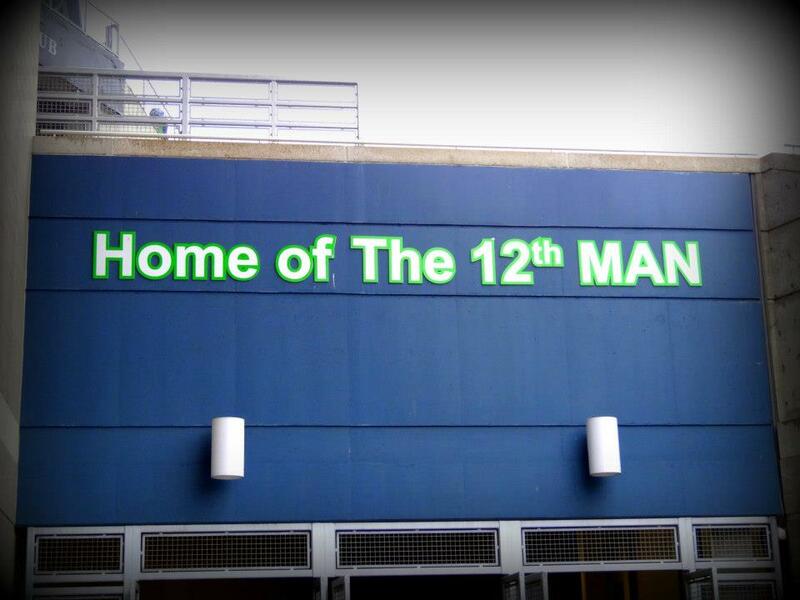 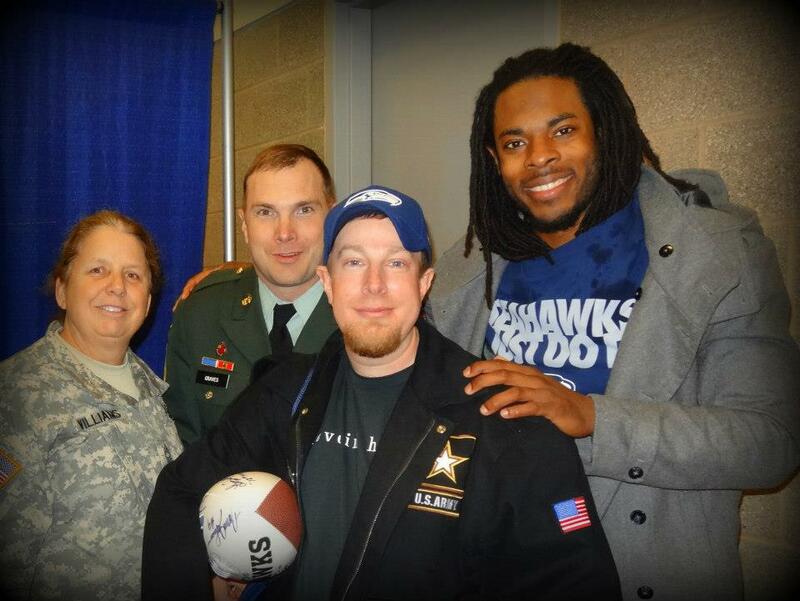 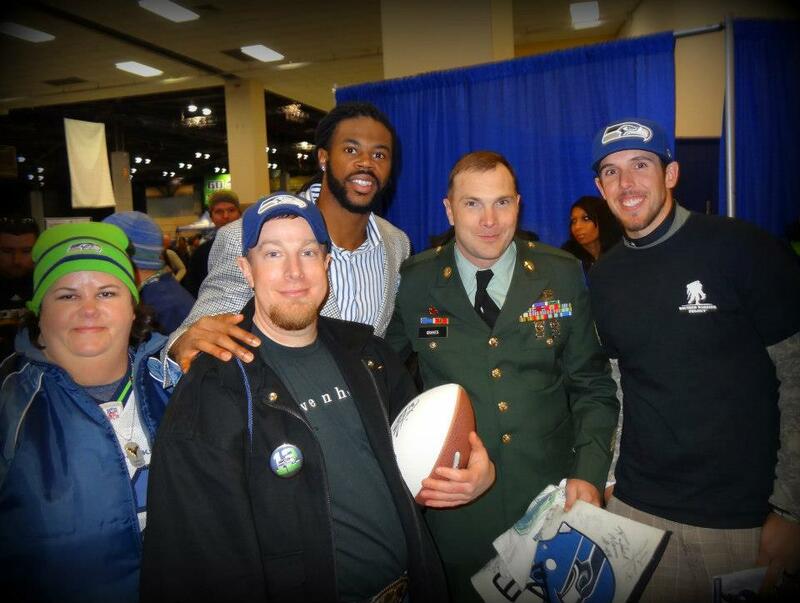 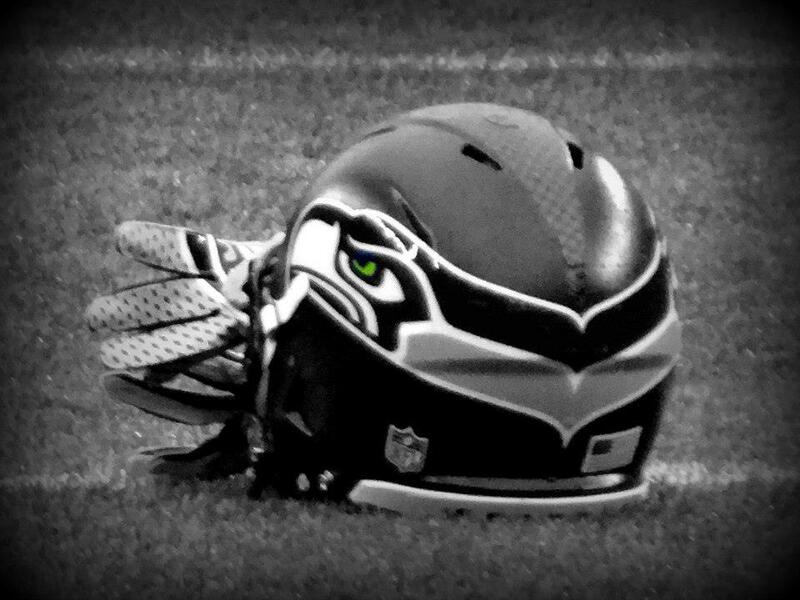 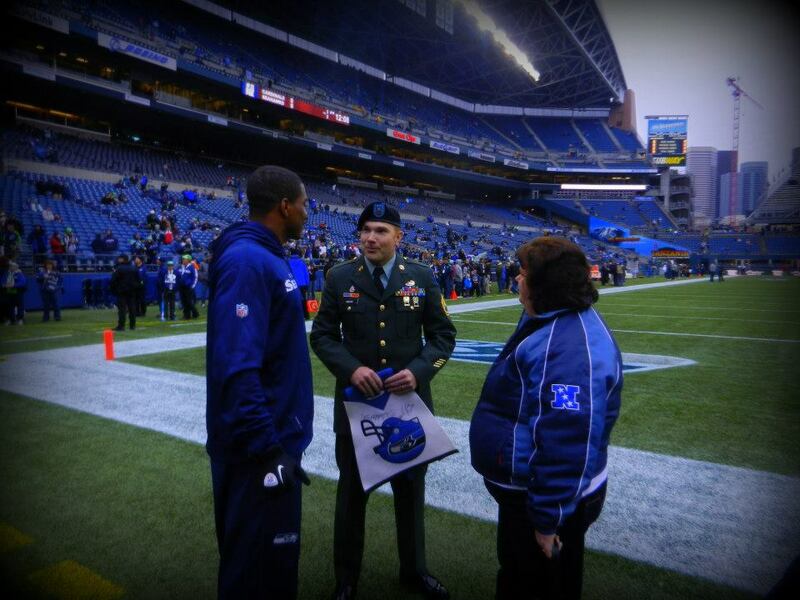 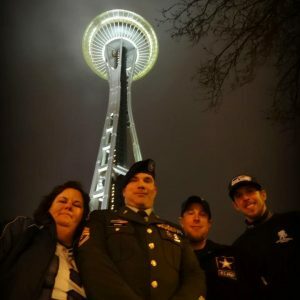 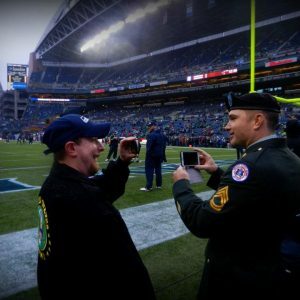 We would also like to thank the Seattle Seahawks for providing a once in a lifetime experience for these brave soldiers! 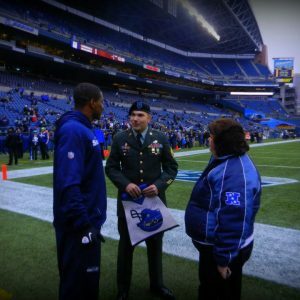 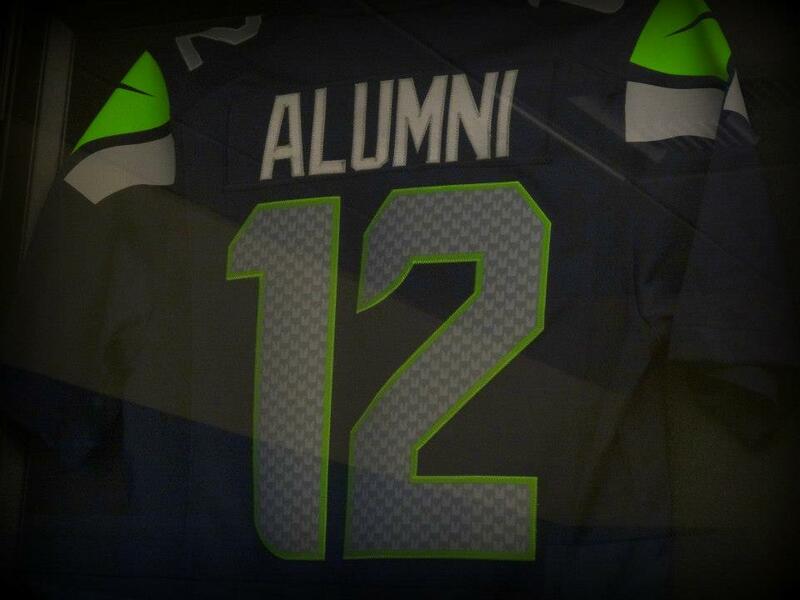 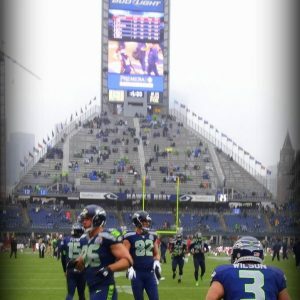 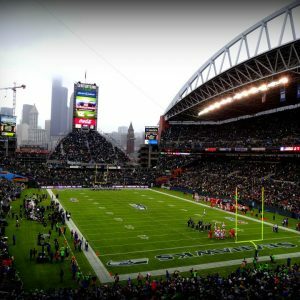 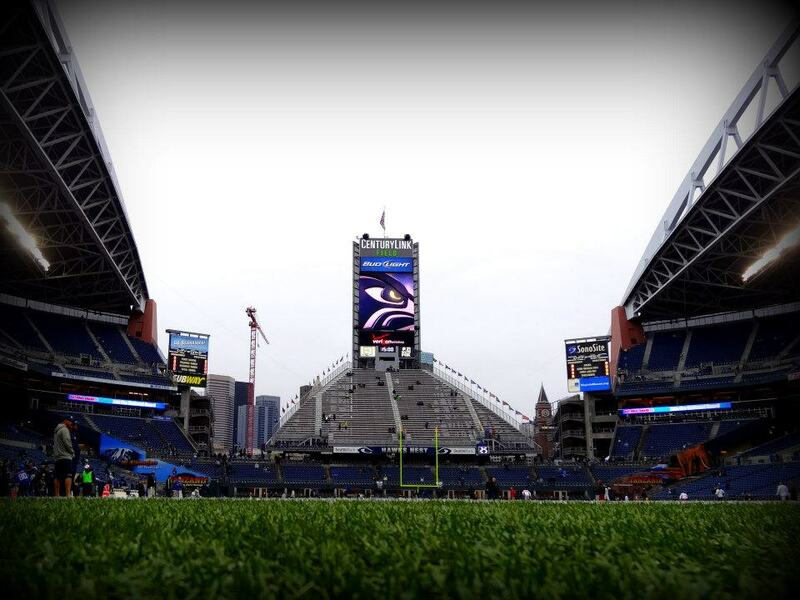 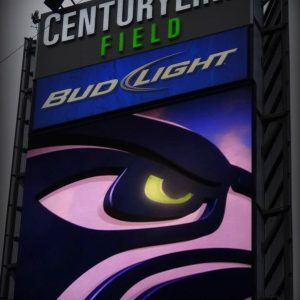 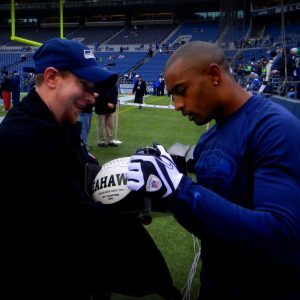 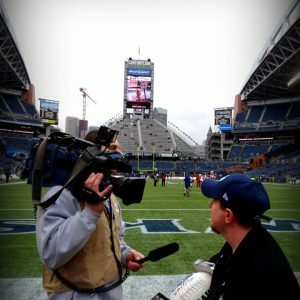 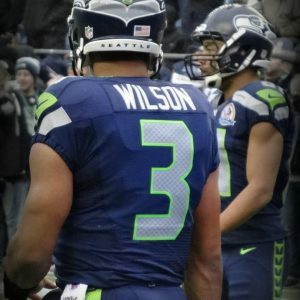 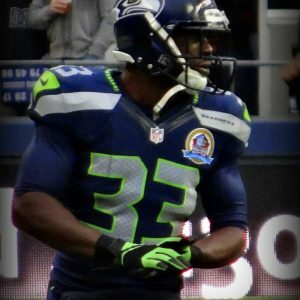 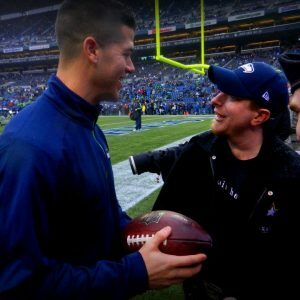 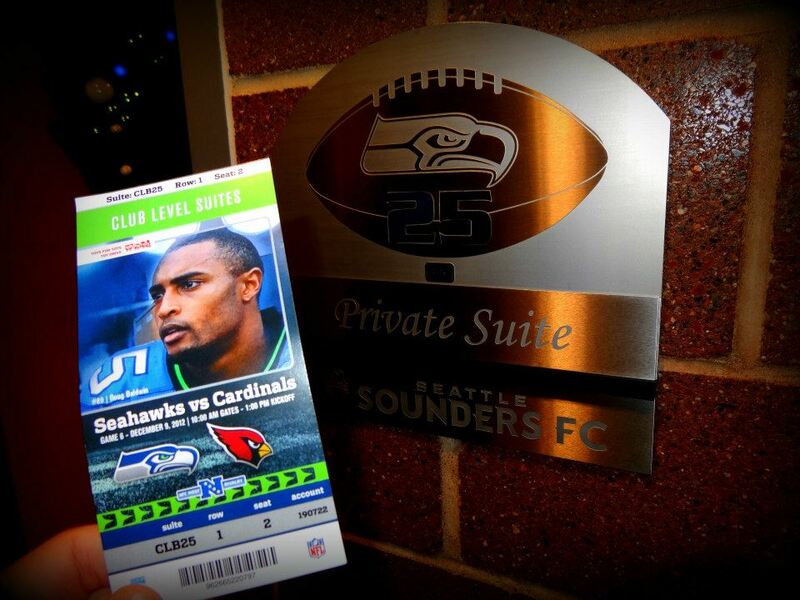 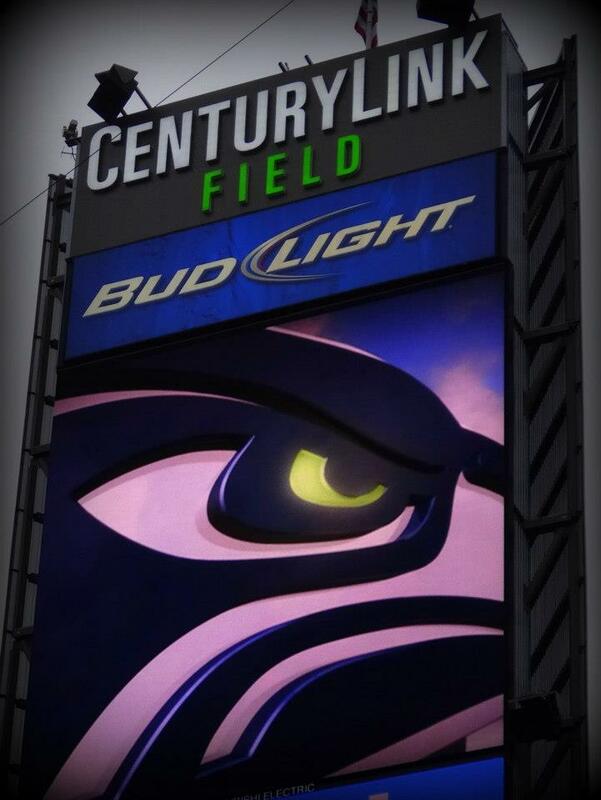 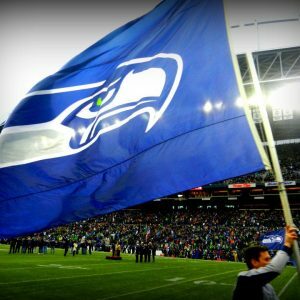 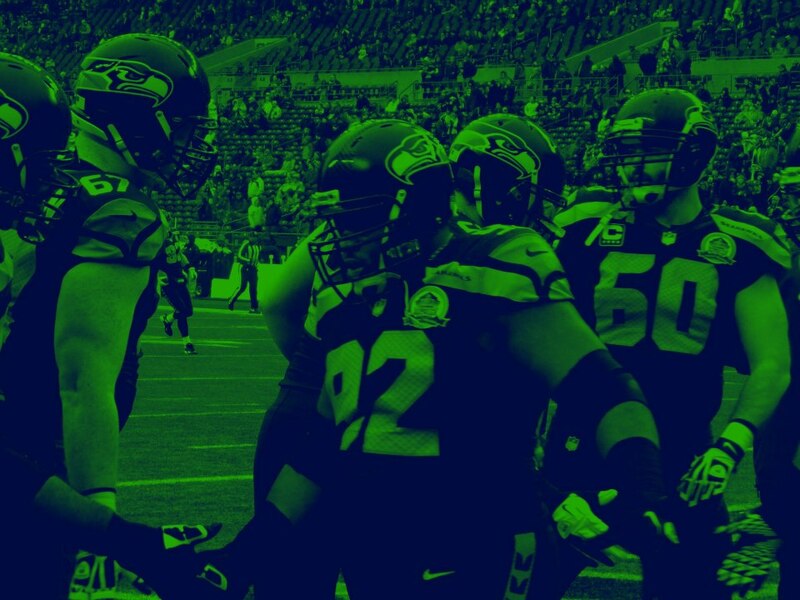 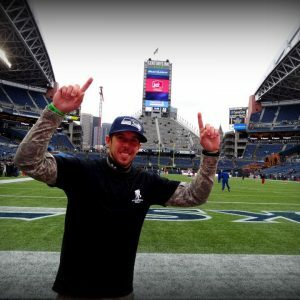 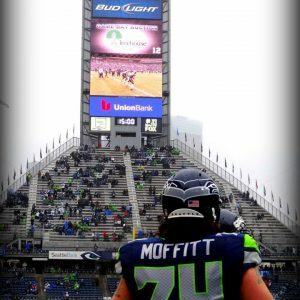 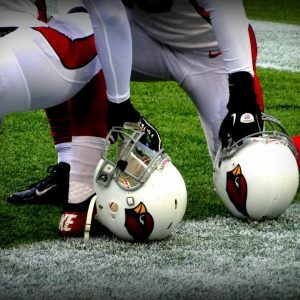 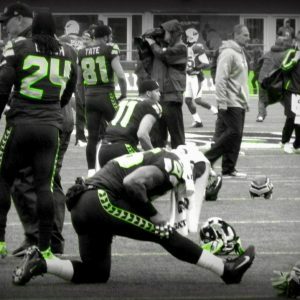 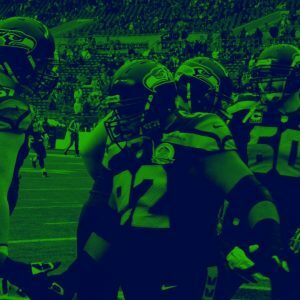 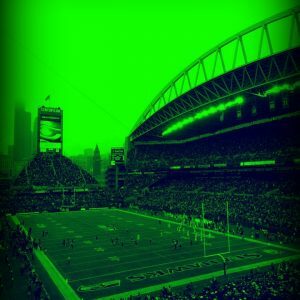 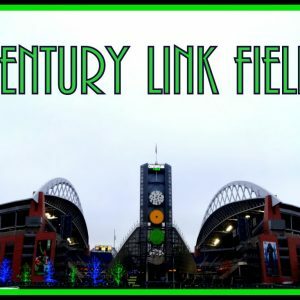 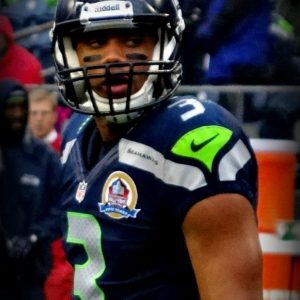 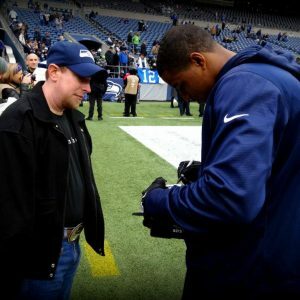 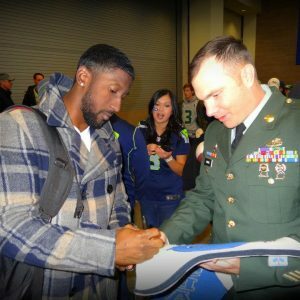 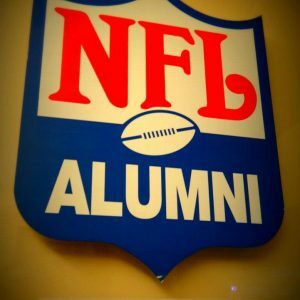 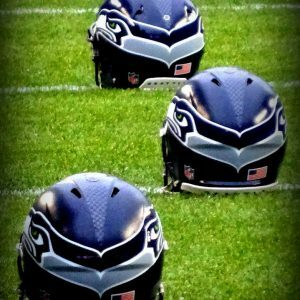 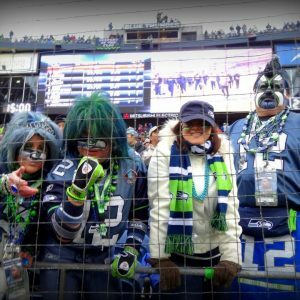 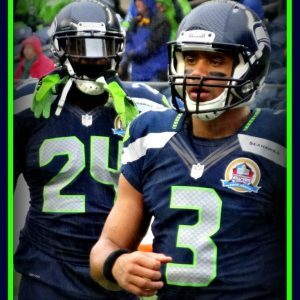 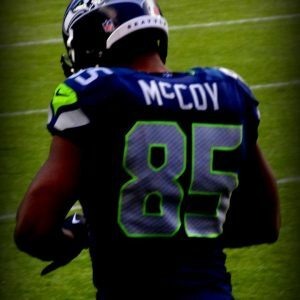 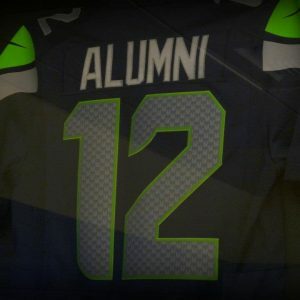 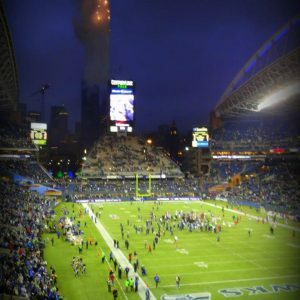 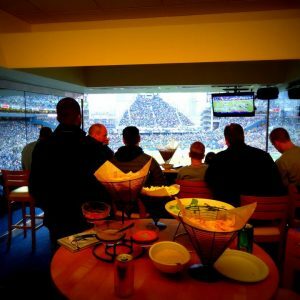 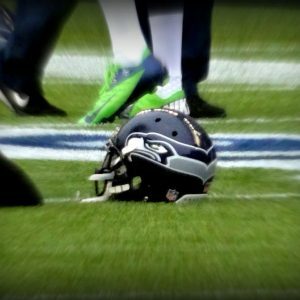 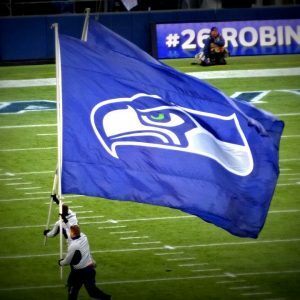 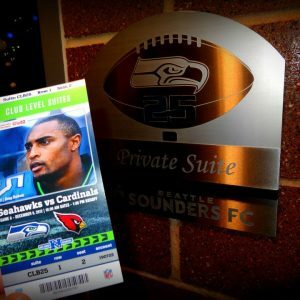 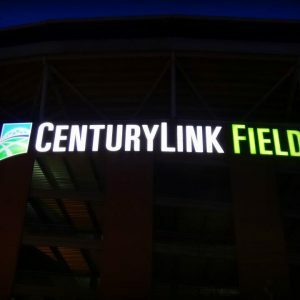 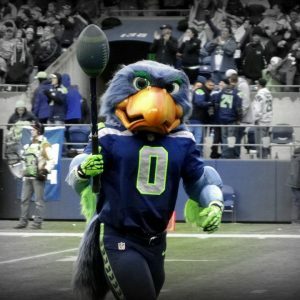 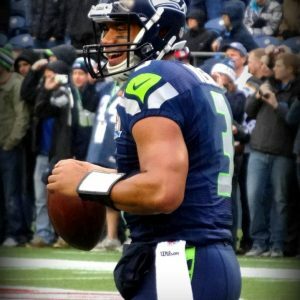 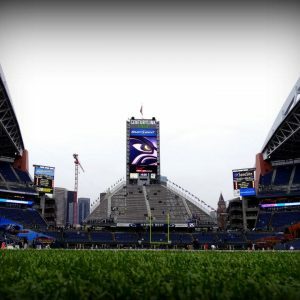 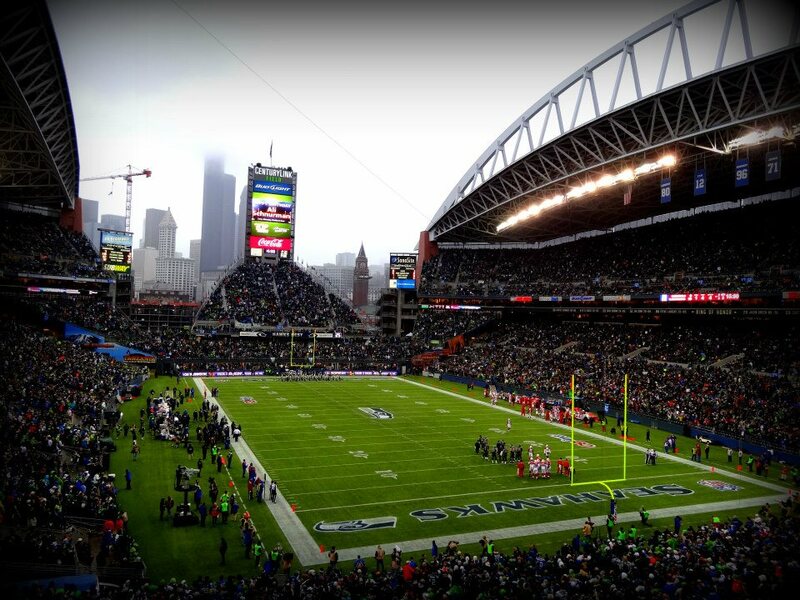 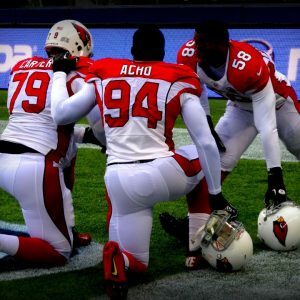 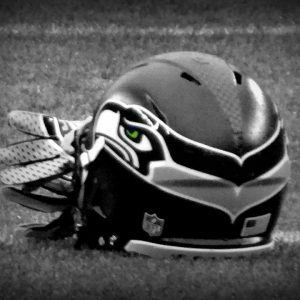 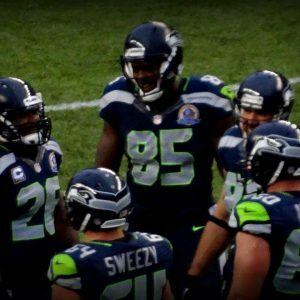 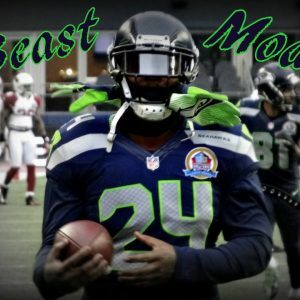 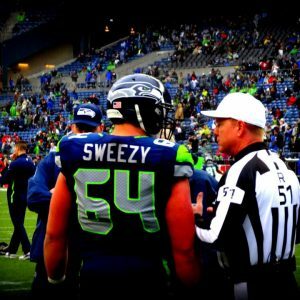 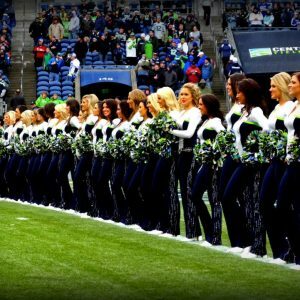 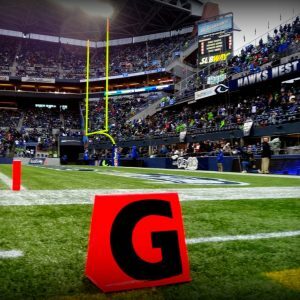 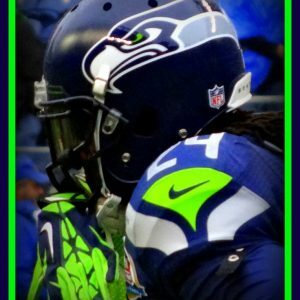 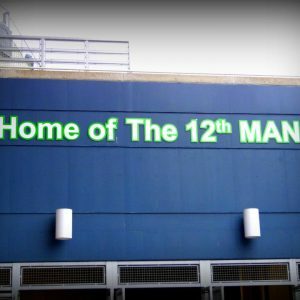 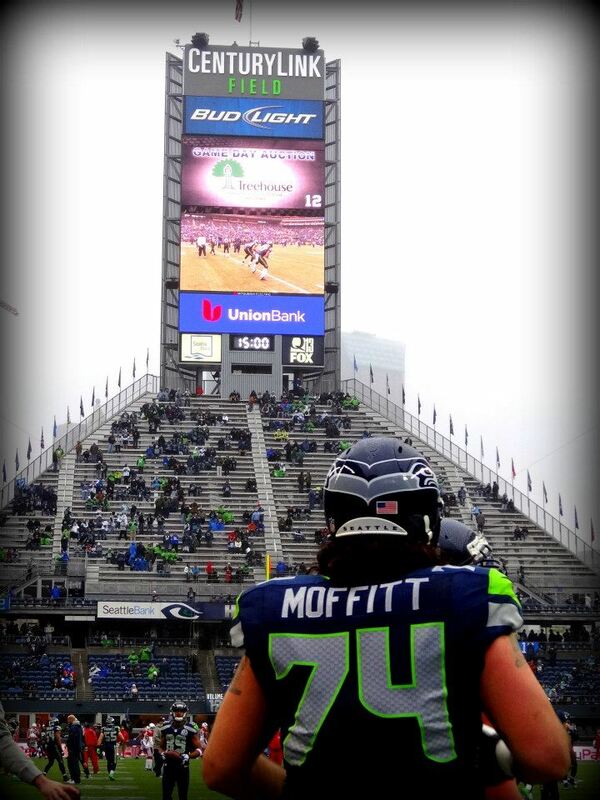 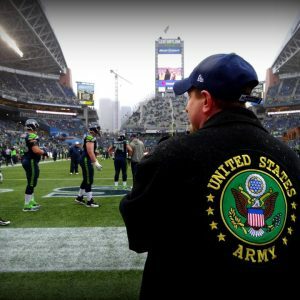 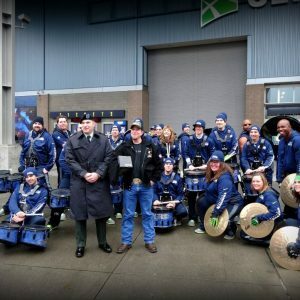 The Seahawks went above and beyond by letting the warriors experience what its like to walk out the players tunnel and out onto the field for pregame warm ups, putting the Warriors in the Alumni suite where they watched the game with former players & giving them post game passes to meet some of the players! 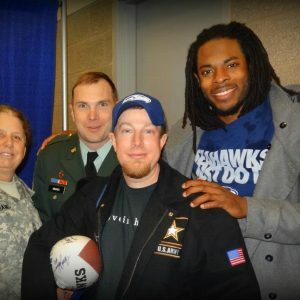 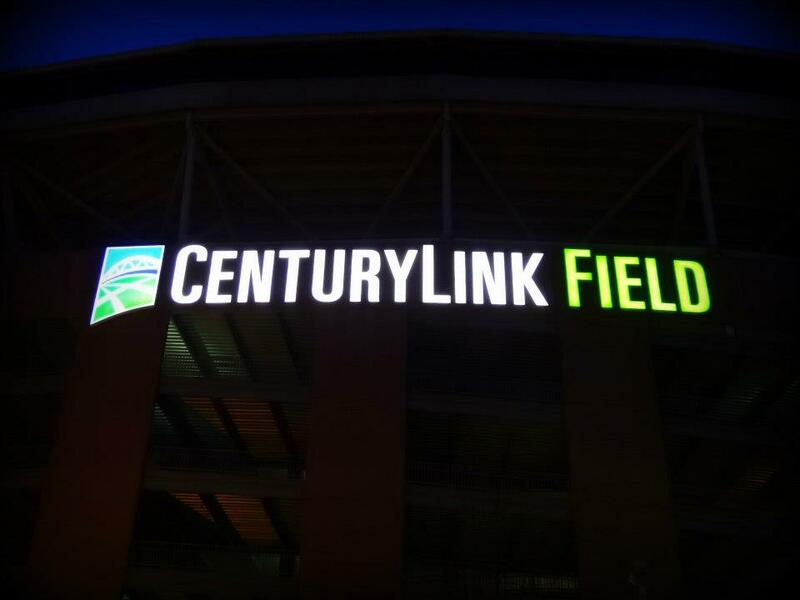 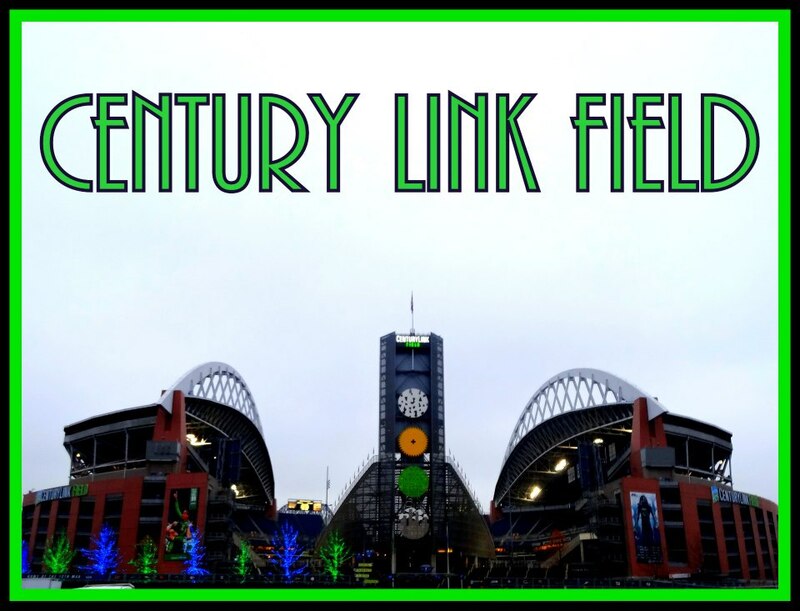 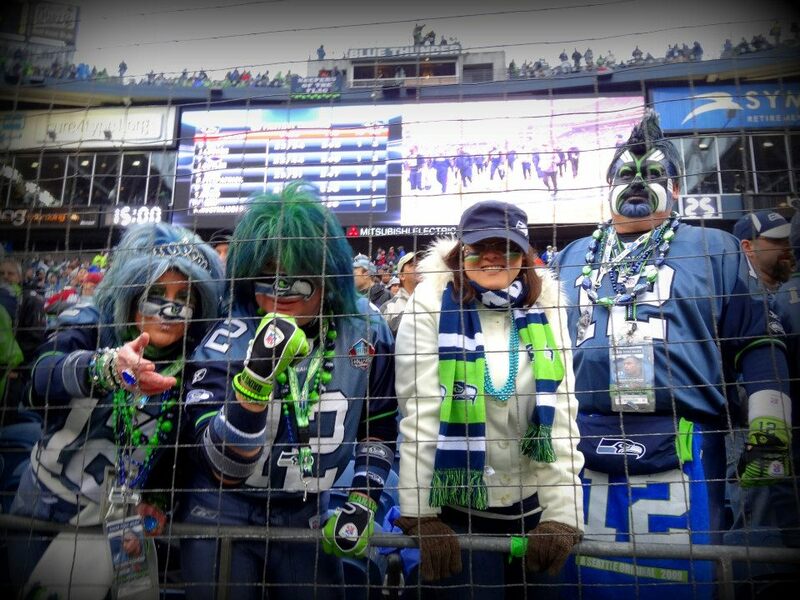 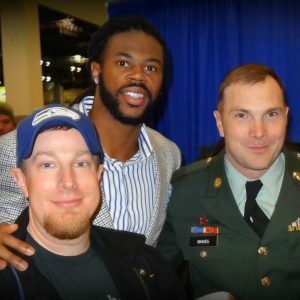 Thanks to Richard Sherman, Robert Turbin, Sidney Rice & Marcus Trufant fir taking the time to hang out with the warriors and take pictures post game. 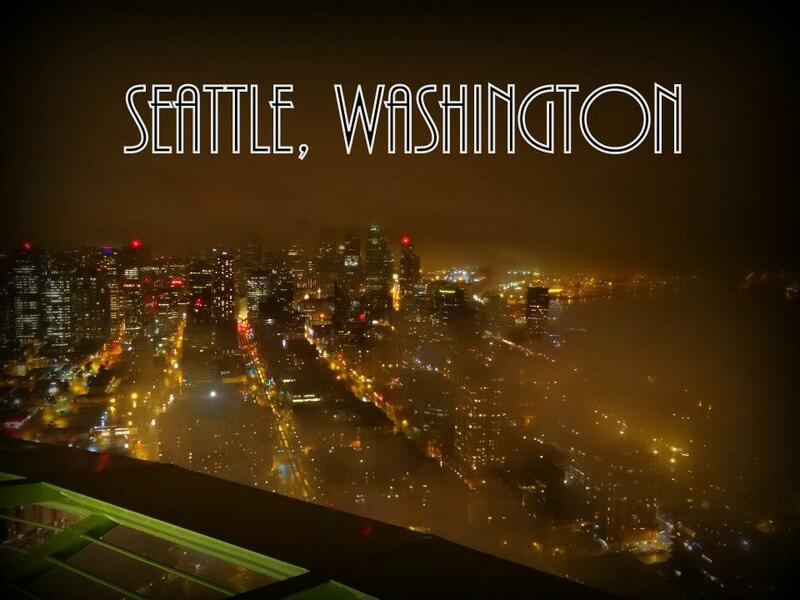 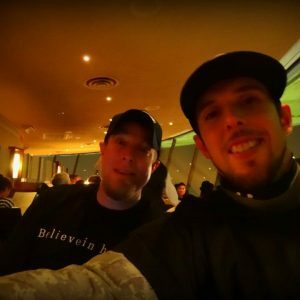 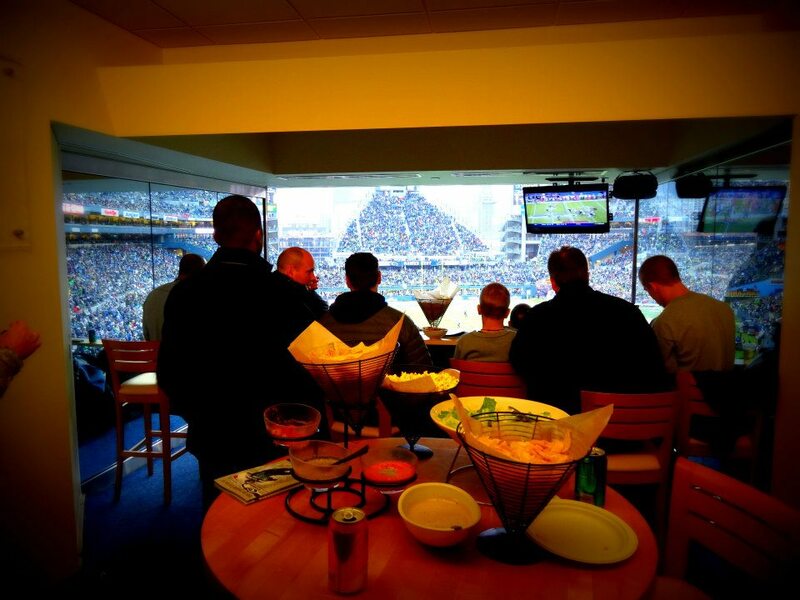 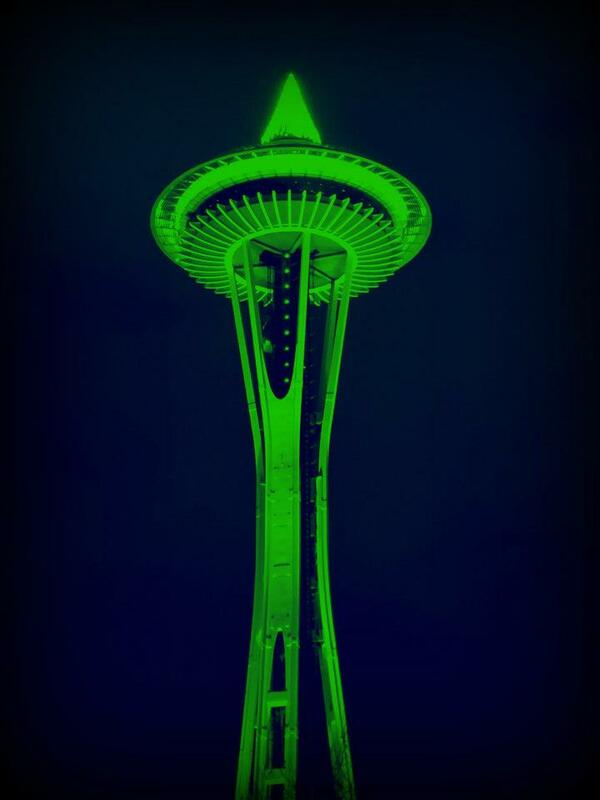 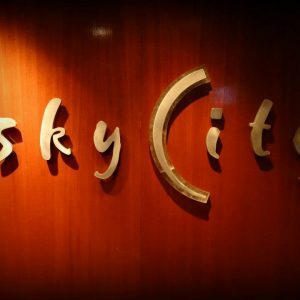 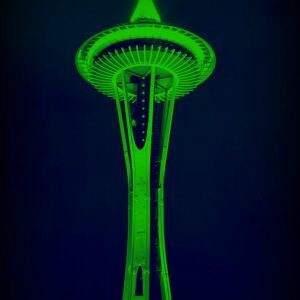 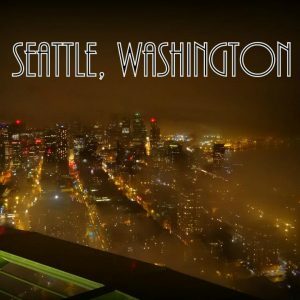 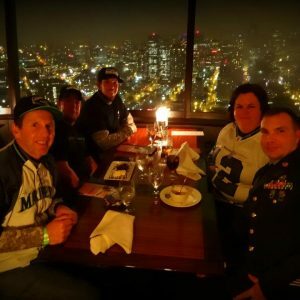 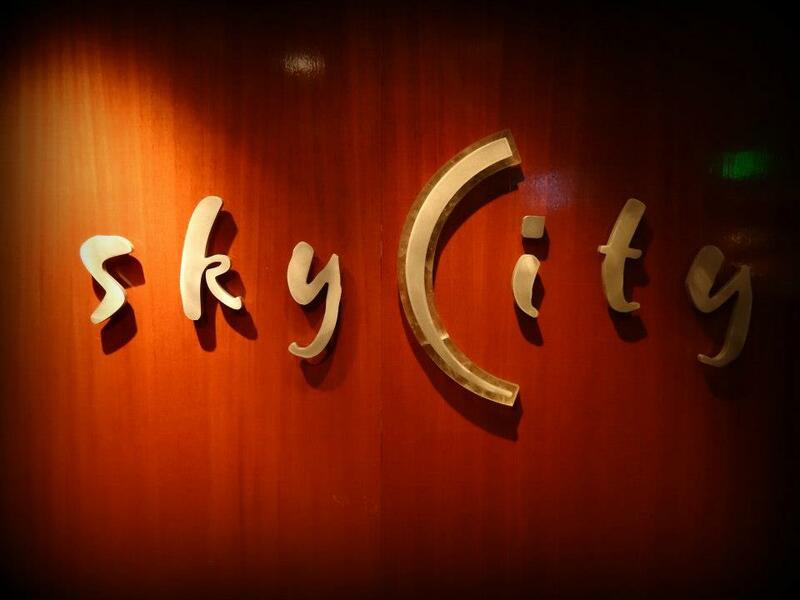 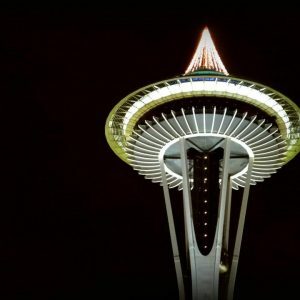 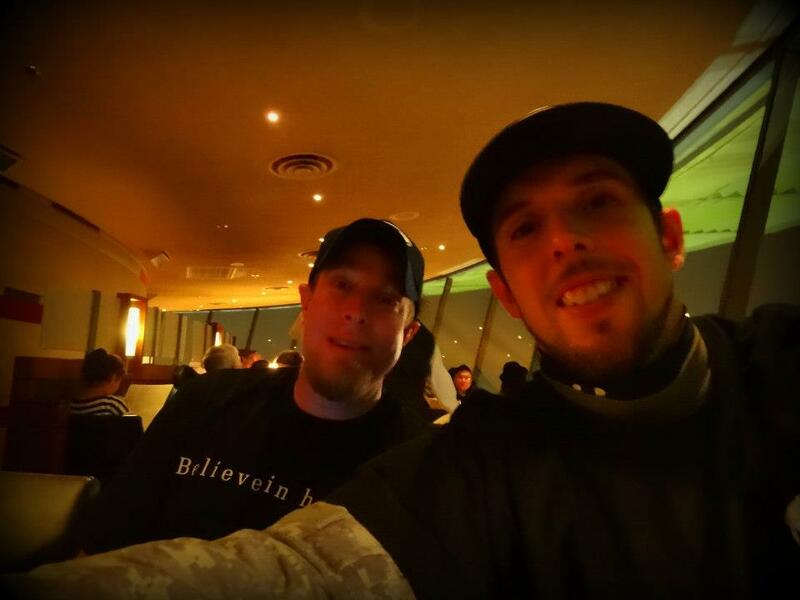 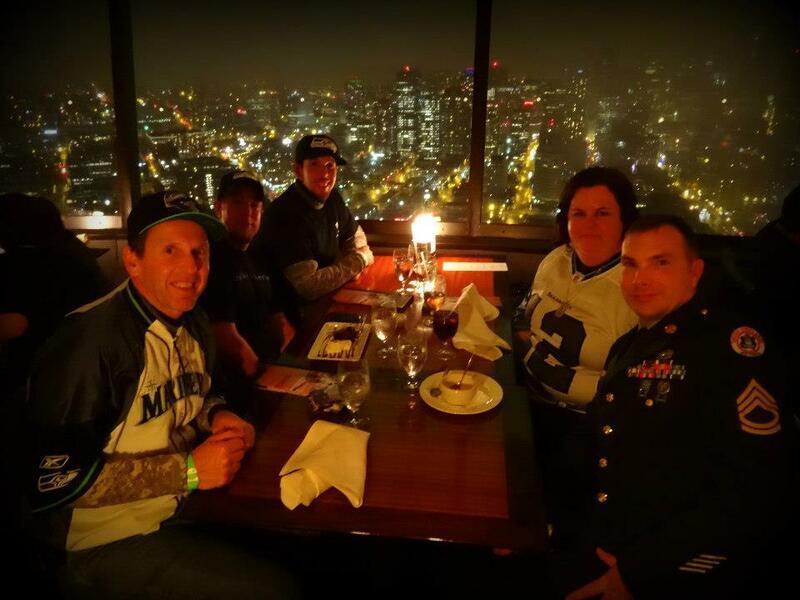 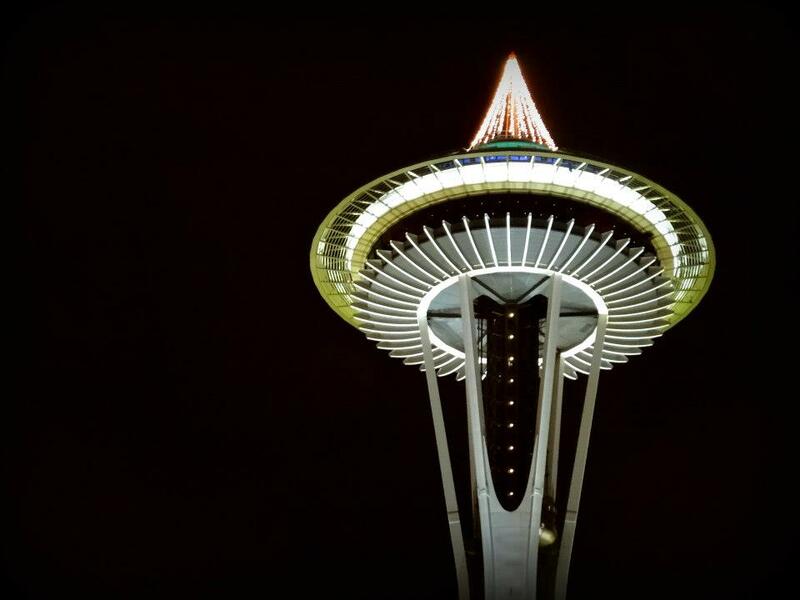 Last but not least, we would like to say thank you to Sky City Restaurant at Seattle Space Needle for providing a post game meal with a view in the Space Needle!